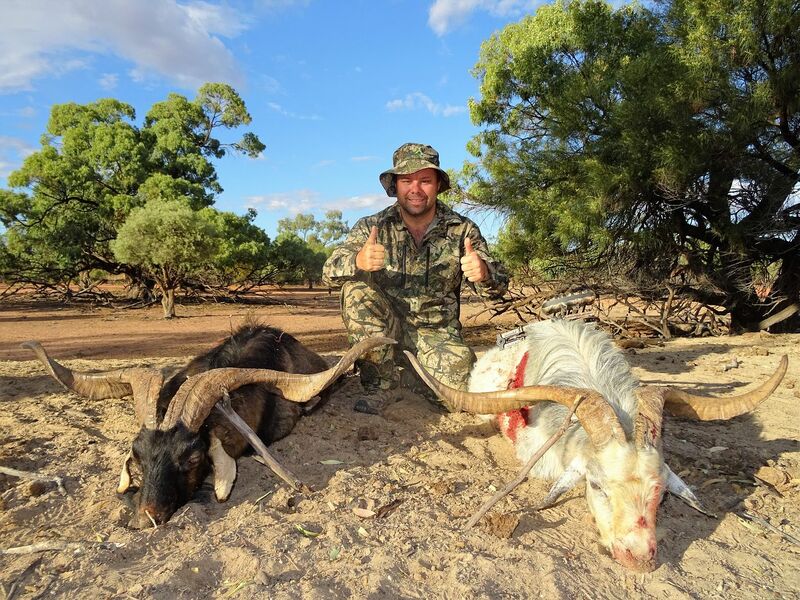 Whilst I didn't want to have double ups on winners for the draw in the major prize draw, XLR8Scotty has done it again with a brilliant recount of another awesome hunt. Scott also wins the monthly prize from Leatherstone, which is a bug free bush shirt. Thank you Scotty for all of your great contributions and everyone get your stories up to be in the running for a bow from Hoyt and also the monthly prizes that will be donated each month. Mayhem and Monsters in the moonlight. The Colorado was packed the day before departure, however it was packed with work tools, electrical cable and conduit for I was heading out to lend a hand in using my skill as an electrician on one of the property’s I have access to hunt on. 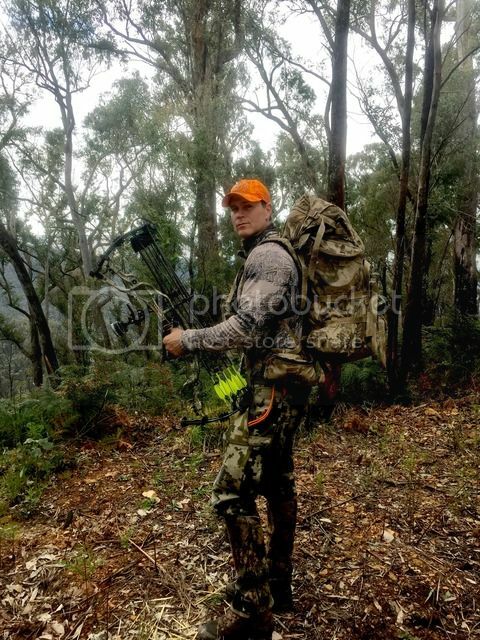 I would be bringing along my bow in the slight chance that I smashed out as much work as I could which may leave a little time for a cameo hunt. So with something to aim for I set about the task of travelling to my destination, starting the work required and busting my behind to get it done. 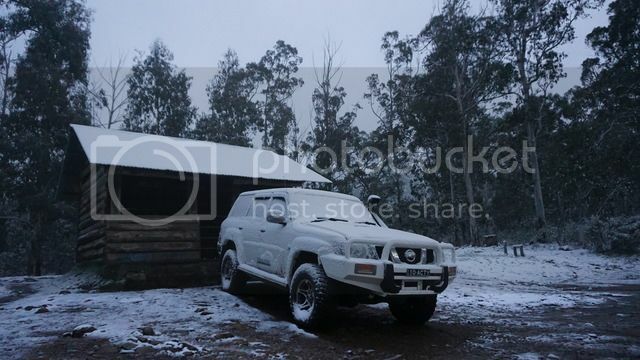 I was wiring up a shearing shed and after leaving home at 4:30am and arriving at 7am I unloaded and got stuck in and worked and worked and worked some more right up until 11:30pm that night before turning in. Up again and at it from 6:30 am, I put in the hard yards again until about 5pm when I was practically finished other than a bit of tidying up and loading up my Colorado. Putting on my hunting gear I drove out to a likely spot that has produced in the past, I did not have much light left and so was driving like a rally car driver to my destination to give me the most time on the ground. Crossing a small flat I noticed some dust kicking up in the distance and shut the engine off. A quick glass showed me some “bulling” billys, a term I use when some big old billy goats are giving a particular nanny a hard time. With that I kitted up and started their way with around 10-12 billys all bailed up around a coolabah tree out in the open grunting and groaning like little teenagers. With no cover and many eyes watching I just moved slowly and kept the nanny out of view and closed the distance. Nearing a respectable shooting range I loaded up an arrow when all of a sudden the nanny has had enough and gets up a gallop running from tree to tree with her suitors hot on her hooves away out into the distance away from me. Wasting time I decided to hit the trail to the spot I wanted to hunt. 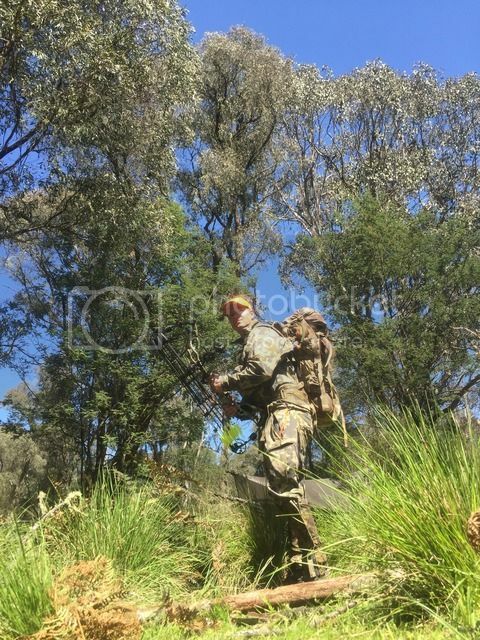 Nearing this location I ducked into some trees and stopped and got my pack on and started circling around the ground tank to get the best wind for my approach, spooking some kangaroos and a small mob of ducks along the way. I edged closer and closer to some trees that would provide cover as I crested the dam bank and spotted a sow making its way in for a drink. With eyes on the sow I quickened my pace to a large tree I would use as cover. 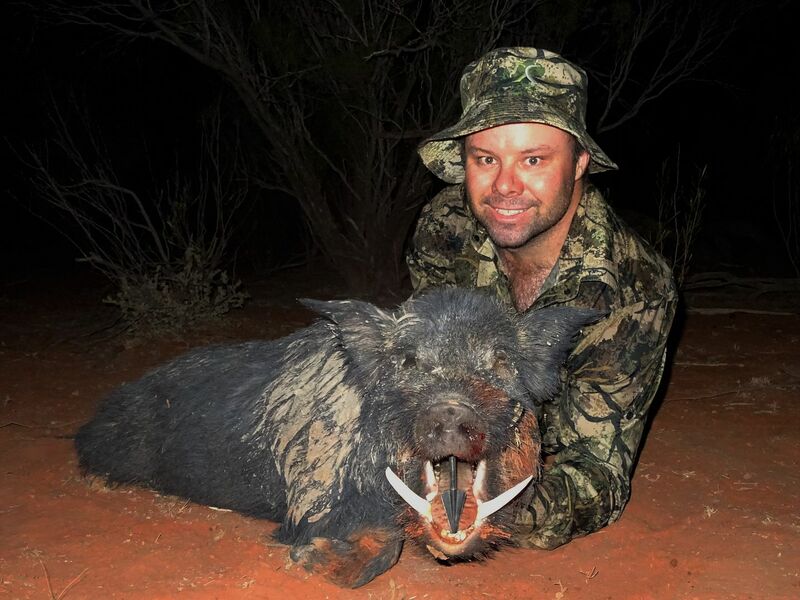 Not long after the sow came into view at around 33 meters and started nosing around on the dam bank where I promptly sent some carbon her way with a quartering away shot. The VPA punched on thru the shoulders indicated by the dust cloud kicking up behind her, she quickly departed only making it 30 odd meters before hitting the deck within view of me. Filming the sow going down on my bow mounted tactacam video recorder I notice a large boar further out in the background feeding in the tree line. I glass him and sure enough even from 250 meters away I can clearly see him chomping away with a nice set of teeth visible. I quickly check the wind before slowly backing back out of view using the dam bank as cover and start circling around to the west to begin my hunt on the beast. 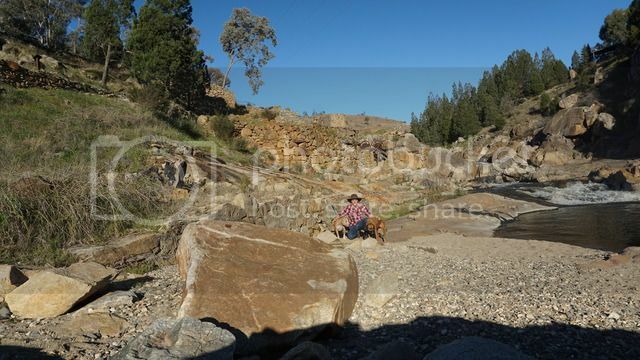 I get down low and close to the water out of view and sneak around utilising the dam bank as cover and then the creek with its tree line as it feeds into the dam. This works perfectly until I’m nearly due west of the boar when I run into a mob of sheep making their way to the water. With the boar out of view I cut inside the sheep and as planned they skirt more north and around me the way I had just come. I’m now in the tree line and loosing light fast, what wind there was would not blow a candle out but it was in my favour none the less. Moving from tree to tree I close the distance, he has not moved much at all and appears to be chewing on some old bones. I keep to the long shadows and get to my last bit of cover being a large tree which is just out of my range of the big brute. I need to get closer and my pulse quickens. He has turned away from me facing east so I seize the opportunity to sneak a little closer. Just nearing my range and for some unknown reason call it a sixth sense or similar he starts slowly walking away from me. We are now both in the open and recent memories not so happy with charging boars wander through my mind quickening my heart rate even more. Several times I get within range but have no ethical shot, when I do he is just out of range and proving very frustrating. He nears some more trees and fallen timber and I hope this gives me the chance I’m waiting for. He is wandering all over the place checking and sniffing about and then turns around and starts walking behind a large tree. My heart races as this is my chance, so I keep his rear end in view and pinch 10-12 meters on a slow trot on an arch in the soft dirt as I close the distance keeping his rear end in view at all times so his eyes could not locate my quicker movements. He stops as do I, that sixth sense again. I range in front of the tree for his intended route but he does not appear. Already with arrow on the string he turns about face and takes a few steps and stops broadside for a perfect shot. Anticipating him stopping, I draw and squat at the same time to clear a low hanging branch. My beating heart is frantically pumping and I settle the pin neatly when he goes to turn again. 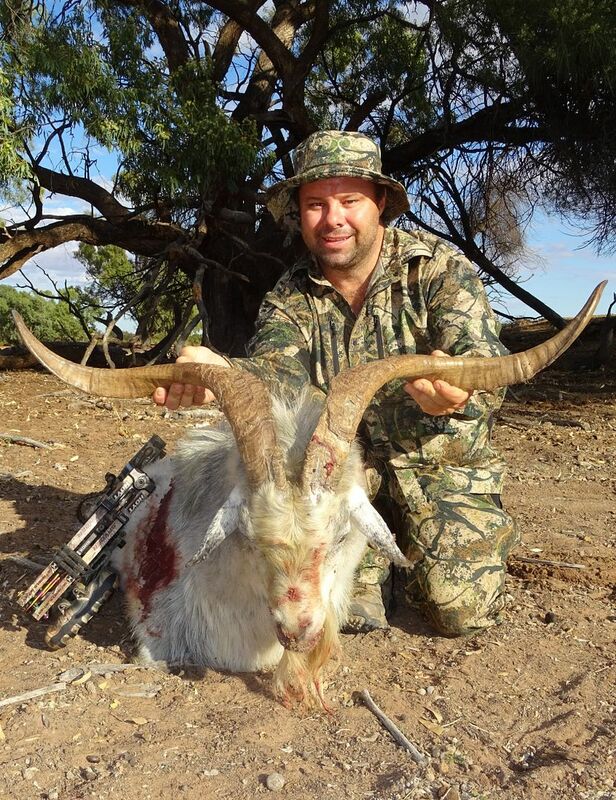 A quick adjustment and the Hoyt Spyder speaks a language we all like and sends down a 175gn VPA on its deadly course. It hits him hard and he gets up into a substantial gallop real quick and thankfully away from me. He kicks up dirt and debris and runs in a wide circle on his departure, a good sign of a lethal hit. He gets to about 80 meters and crashes to the ground. The shakes then hit me hard as the adrenalin pushed through my veins, what a feeling. I head over and check him out, WOW he is a howler of a boar. I spend some time to clean him up and take some pictures. It is a full moon tonight so I wait for it to rise above the skyline and then take a few more photos for a fitting tribute of a great hunt and a treasured memory. 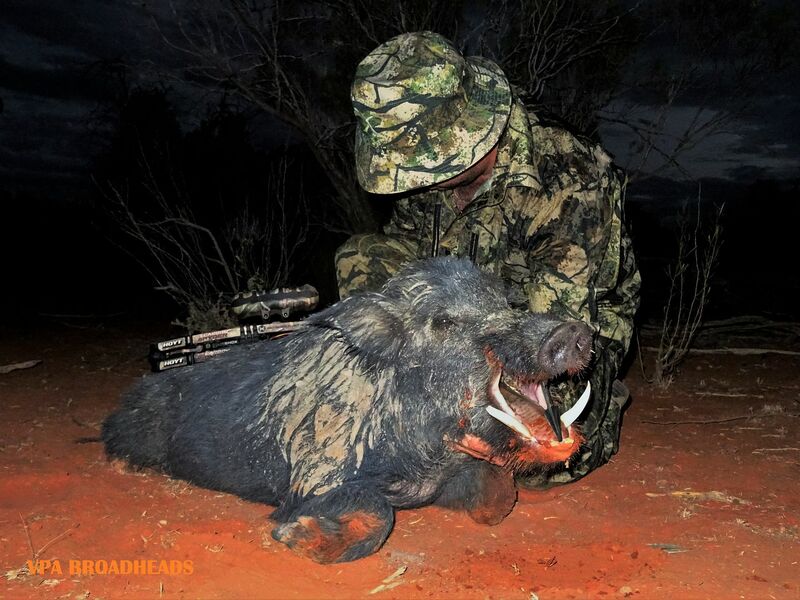 The big boar later measured out at 28 2/8 and is now my PB. 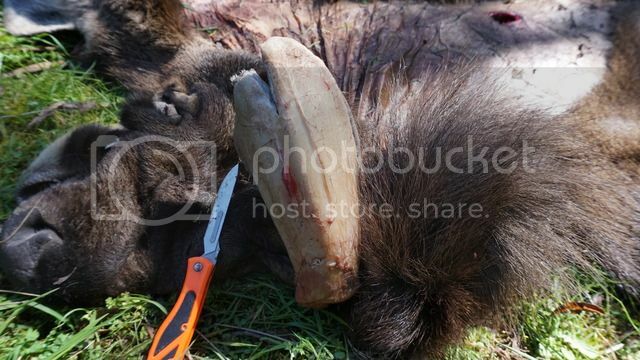 One howler of a boar. After removing his jaw I started out for my vehicle and completely forgot about the sow I was that happy and content for the days effort. I called into the owners place to say G’day and update them on the job that I was doing. They were really grateful and invited me in for dinner and a few beers which were much appreciated. I told them of my plans for a quick hunt at another dam the following morning before I was to pack up and leave for home. After dinner and the customary goodbyes I drove out the back of the property to be near my hunting ground for the following mornings hunt. This saved me plenty of time in travelling and gave me a little sleep in of sorts of which my body certainly cherished. The moon was bright again but I slept like a baby until my alarm sounded in the wee hours of the night. Not having far to go I hiked into the large dam and actually had to tip toe in sneaking around some bedded goats in amongst the trees and timber surrounding the area. More were even found camped up on the dam bank waiting for the first rays of sunshine to bring them warmth and comfort. Little did they know I was here to insert some mayhem and chaos instead? As you expect I did not have to wait long for the goats in the area to get up and stretch and start their way in for an early mornings drink. Soon enough two reasonable billys came in and went down to the water out of view for a drink. The light was getting bright enough and the gentle breeze strong enough to be wafting a little of my scent around and getting a few goats restless. After a while one of the two billys materialised and joined the circus of snorting and stamping their disapproval of the strange shape that was me. 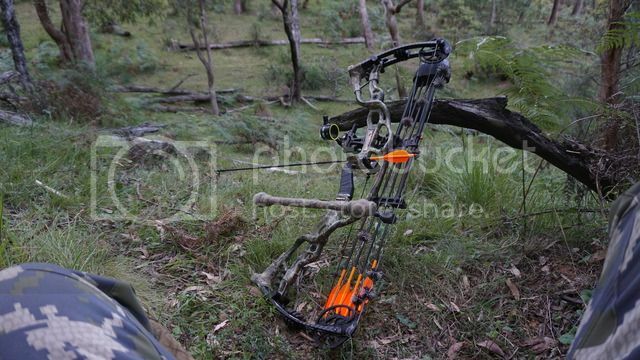 Already with an arrow on the string and filming, the bigger of the two billys popped up just a little to my right. I waited patiently for an opportunity to draw and soon had the chance and promptly drew back into anchor. I floated the pin tight in on his chest as he went to vacate, but he only went a short distance before stopping for another glance back at me. I clipped off the shot at 26 meters and watched as my arrow darted out and smacked thru both shoulders punishingly. At the shot all the goats hit the road but the 37 inch billy only made less than 20 meters from the point of impact. A fantastic start to the day. 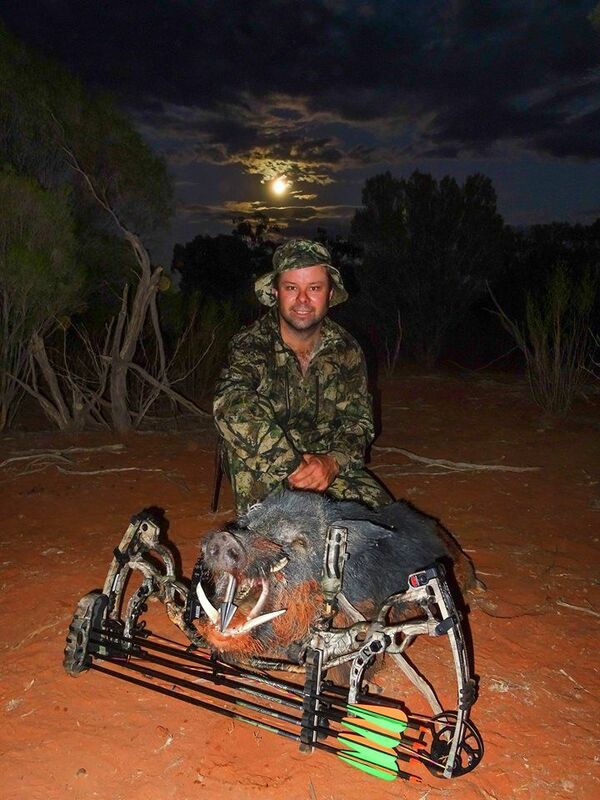 Well a great boar and awesome billy had now succumbed to my arrows. Still with some time to hunt I thought I would walk up the creek a little ways to check a small feeding flat and maybe find some more critters. 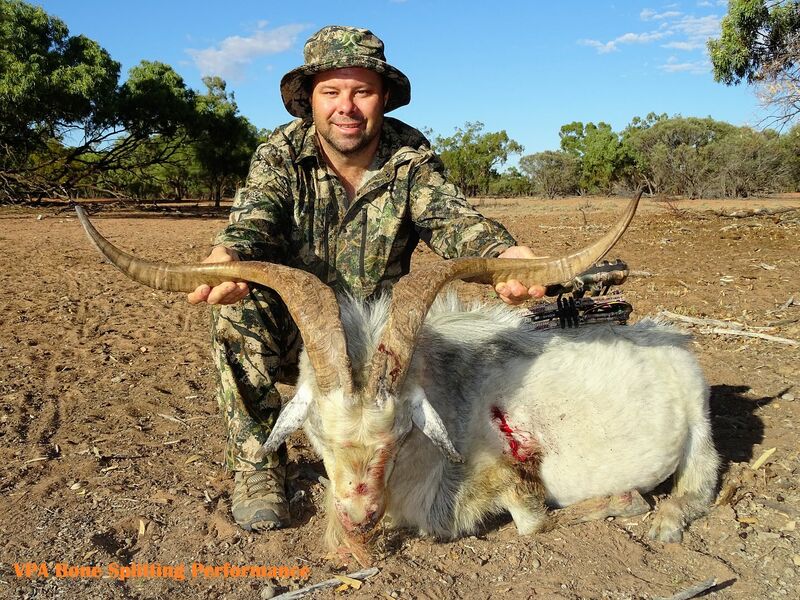 I reached the flat and no worthy critters were seen so I started to make my way back stopping and glassing several mobs of goats as I went, no shooters were spotted as well so all were left alone to grow a little bigger. I got back to the dam bank and started my ascent but was stopped in my tracks as I crested the dam top and spotted on the far side a nanny with a real heavy looking monster billy laying down close by. The binos were not needed to confirm this, he was a cracker. I had the wind in my face but had to circle right around to the west to have any chance of getting an arrow away at this fella. To do this I would have to use the dam bank as cover but I would be out of view of my quarry during this. So to limit the downtime so to speak of not having him in sight I ran like Usain Bolt for another gold medal around to the west. Lucky for me there were no more goats other than behind and to the south of the ones I pursued. Now in position I nocked an arrow and glacially started my ascent of the dam bank directly above the billys location located by a tree I took note of before I started the stalk. Climbing a bank like this leaves you sky lined so I drew first and slowly crept up treading in the soft dirt as I went. Nearing the top I run into the nanny who was leaving the area, she inturn spooked and snorted a bit and headed south a little way to stop, turn and watch. Well you don’t get big by being dumb and the billy quickly got to his feet and followed suit. But curiosity is a funny thing and got the better of him as he stopped for a quick glance back as well. 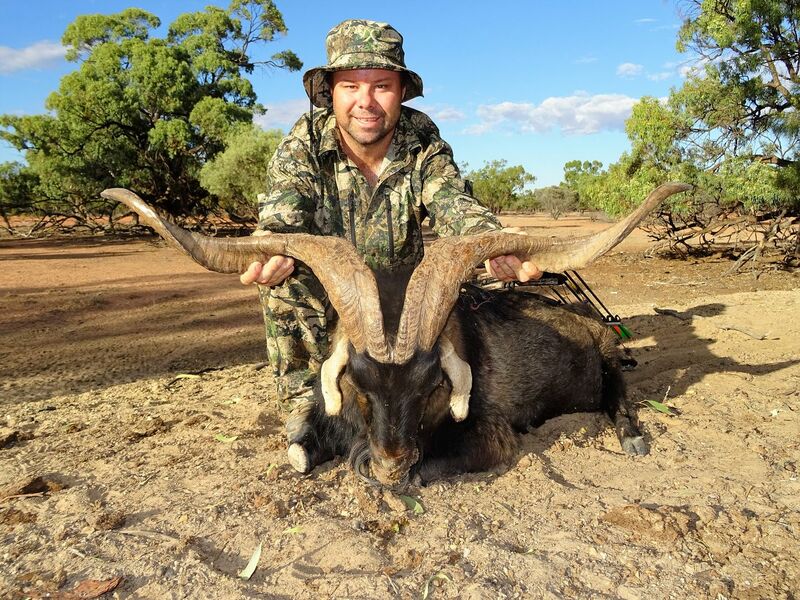 Already at full draw the Hoyt Carbon Spyder was poised ready and willing to flex some grunt and so it did when it unbridled 80 pounds of might and power implanted in the end of a 175 grain VPA penetrator on the end of an easton axis 260. It freaking hits hard. It ploughed into him dropping him on the spot not 10 meters from my first billy. Man I was pumped, the closer I got to him the bigger he got and the heavier he looked. He measured out at a touch over 39 inches, a very nice specimen. 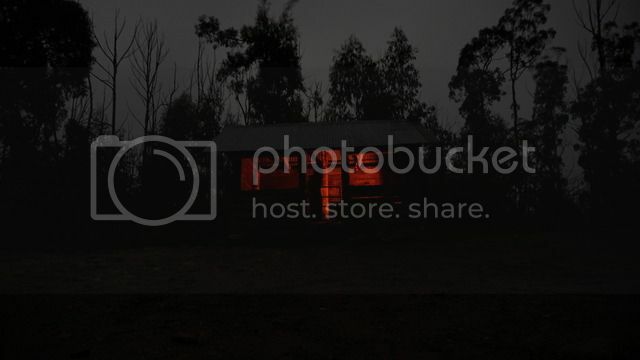 I went about getting heaps of photos to remember and recollect the memories of the hunt. After the individual photos I put in the effort to get the two big billys together for a fitting photo and end to one memorable hunt. What a cracking few days away, working hard and hunting hard for just rewards. 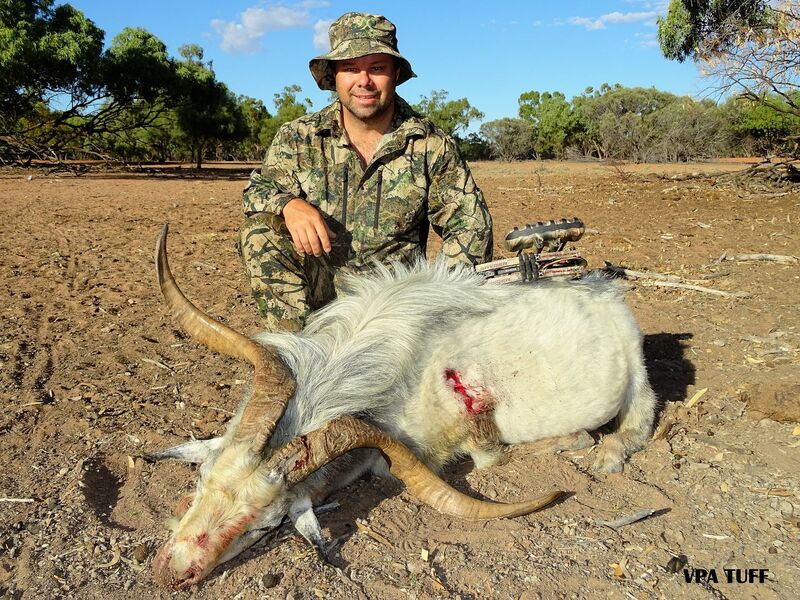 The effort put in to gain and keep access to prime hunting locations surly does pay off. I’m forever grateful to have the opportunity to hunt the places I hunt. I think however that the critters left there are grateful that I was only hunting for a short duration or more monsters may have fallen in the mayhem of the moonlight. 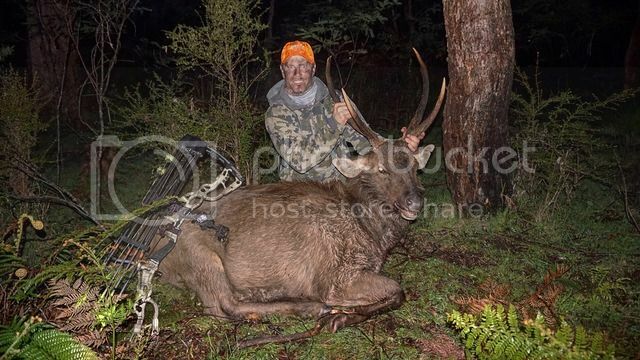 Bow: 2014 Hoyt Carbon Spyder @ 80#, 27” draw. Arrow: Easton axis 260 spine 27.5”, 4” killer vanes. Rest: QAD drop away, cobra release. Broad head: 175 grain VPA 2 blade, tuff beyond belief. Total arrow weight is 556 grain. 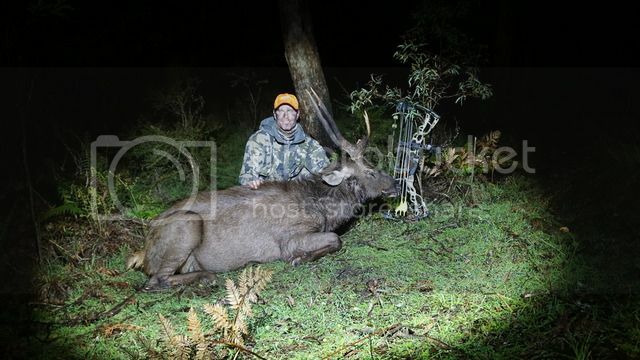 The winner of the October Stories prize for one of the best recounts of a hunt we have had on the forum for quite a while is Swede for his epic Vic high country Sambar hun. Aesome work. 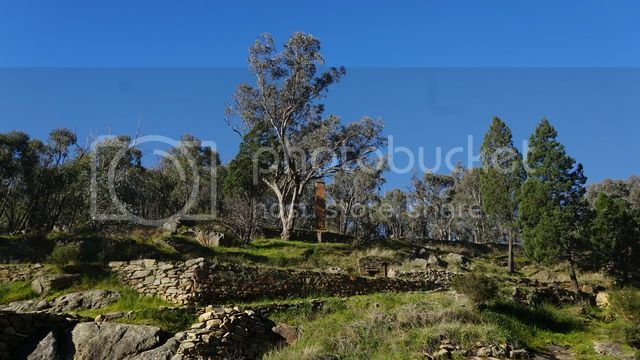 Before I start the story of last weeks adventure in the Victorian high country, I want to take a step back in time and tell the untold tale of the one who got away during a similar trip last year. It was a sunny day in the middle of November 2015, I woke up early to hike to my favourite spot for a Sambar hunt. The location I had chosen carefully. I had visited the same place several times before but even though it is quite easy to find this particular spot, the hike is more effort than most hunters are willing to put in. Not to mention that you will need to be of a certain degree of fitness to even reach as far. Once I set camp and got some preparation underway I packed my day pack and headed towards the gully I had in mind. This particular gully is set quite steep, close to a seasonal water source. I had seen a number of deer before and in 2014 I had had a stand off with a big stag at 10-12 m on the ridge line above this steep gully. That time, he was smart enough to elude my bow and arrow even tough I was eye-to-eye with him for a good 10 minutes and probably at full draw for 2. No ethical shot presented itself so I walked back with my head low. Already then planning my return. Tenacity wins the race. The sun was setting and I had made it about halfway up the gully when I caught some movement further up. I snuck in to some skinny wattle trees when I spotted a hind feeding about 50 m above me. I had very sparse cover so I opted for a still hunt. Within minutes the whole family unit arrived. I had 2 hinds, a young stag/spiker and a young one feeding away. I decided to see if I could get a 40 m shot when I saw the tree whipping further up the hill. A large stag stepped out at 60-70 m, checked on the rest of the deer before getting back into bashing the young saplings. I sat still for probably 10 minutes carefully watching the deer. Every now and them they would flick their head up and stare in my direction but soon resume feeding. I had dropped my boots and made an attempt to close the gap but was almost busted. I now had one one small piece of cover behind me and very little opportunity to move. I watched the larger stag wonder up to a certain tree and watch the hinds multiple times. 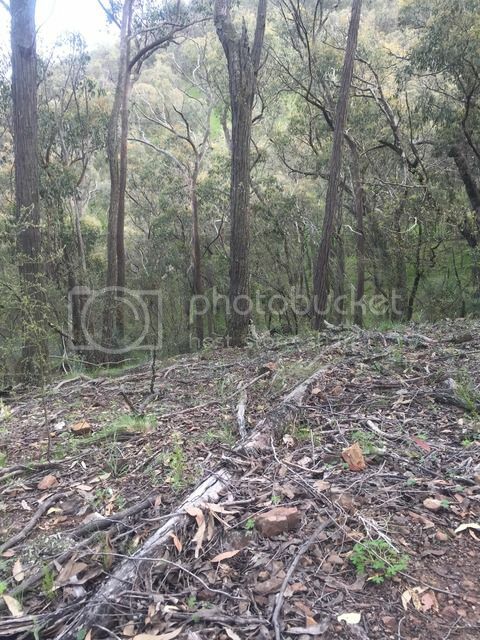 The tree was at 50 m straight across the gully, level with me. After a further 5-10 minutes I realised that the deer was moving slightly away from me and if I wanted a chance for the stag I would need to take the 50 m shot. It is hard to estimate the size but I would assume he would be around 28". I made the choice to set my Spott Hogg dual pin sight to 50 m and wait for the stag to make his move towards the tree as normal. If everything planned out I would get a perfect broadside shot. I saw him walk towards the spot and I drew my bow when he side stepped and stood on the wrong side of the tree. I had no clear shot. From here everything happened very quickly. As I let down he suddenly moved quickly straight across the clearing on a diagonal towards me. When he passed the only cover between us, a small tree 10-15 cm wide I quickly came to full draw. He walked up on my side of the gully and stared in my direction. During these few seconds I remembered I had my pin at 50 m. He was far closer than that now. He continued to walk up towards me. I estimated the range to be around 25-30 m. I put my pin under his brisket and let the arrow fly. I can tell you that after this instance I spent a fair amount of time practising shooting different distances with the wrong pin to learn the drop. 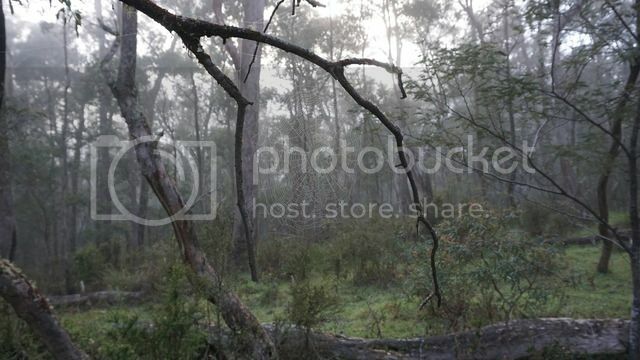 I heard the solid sound of the arrow hitting a black wattle smack on. Arrow sailed well over his back. I have just missed my first large stag. The deer got alarmed but did not spook to badly. I could watch them quickly but fairly calm trotting across the hillside out of view. Last light disappeared and I was left with a cold feeling running down my spine. I tucked the tail between my legs and went back to camp. I did not want to disturb the gully anymore and decided to collect my arrow during day light. The next day during lunch I went back to get my arrow. 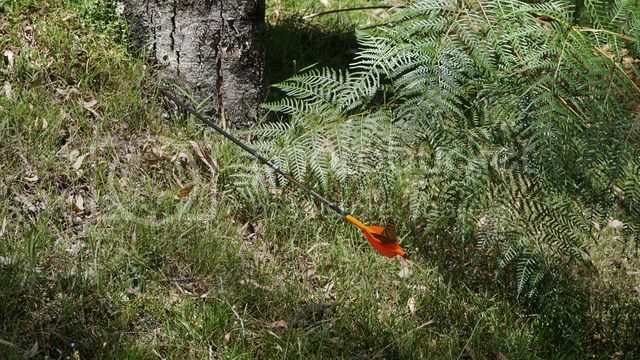 The irony when I found my arrow as part of nature with a butterfly resting on my fletches. After this week I reviewed my gear, practised more and started to plan another trip back to this spot. Being a Sydney sider I only get the opportunity to hunt the ANP once or twice a year. It actually took me a year to get back to this particular spot. 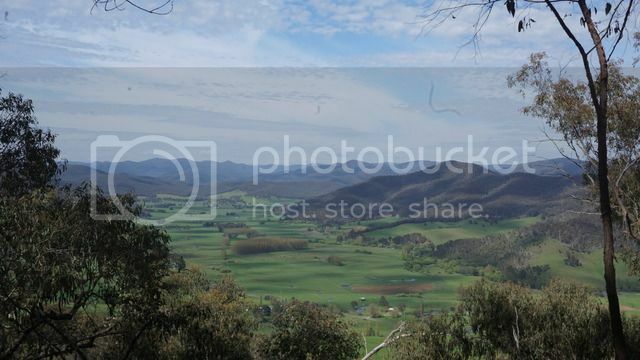 I was Monday morning and I was in my car, on my way down towards the Victorian high country. In a stroke of luck my work place needed to do some renovations and my work was very limited so I got a whole week off. In the week leading up I had had some concerns for the weather forecast. If you remember parts of Victoria had huge floods and the Owens basin had seen more water than ever. 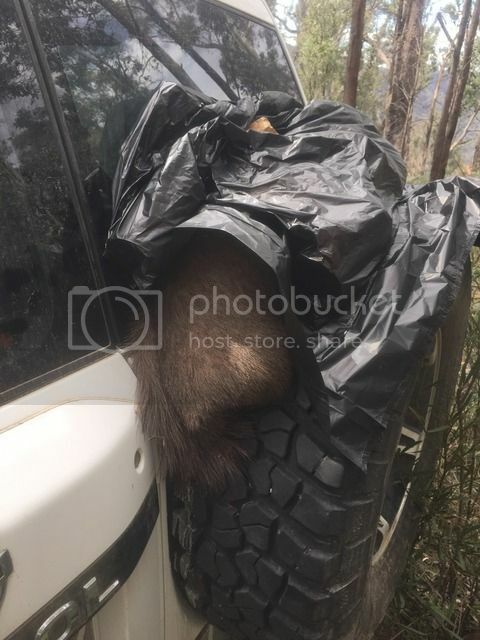 My hunting spot was a bit further away but after speaking to Parks Victoria I got the bad news that entering the ANP the way I normally do would be impossible. On top of that the annual track closures where still in place. In the days leading up to my departure I spent hours trying interpret google earth to find an alternate route to my treasured gully system. I had found a way which both Victoria parks and friends who knew the area thought was a bit radical. 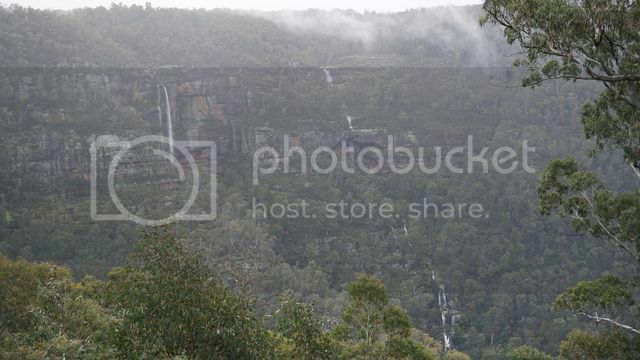 It would be a hard walk, wet, steep and long. 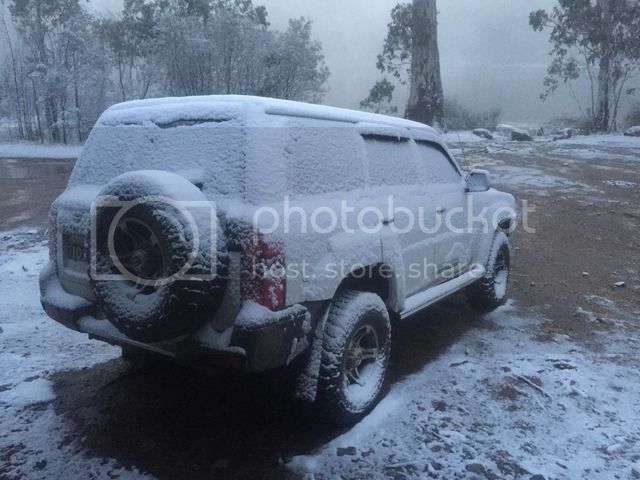 On top of that they expected snow at higher altitude, very different to my trip previous year. 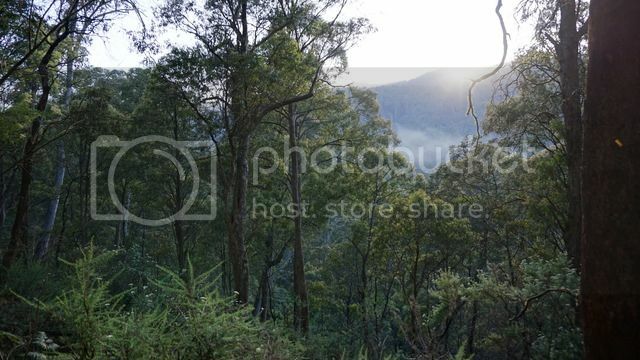 As I had a whole week I decided to look around a bit on the way, visit some new state forests and do a bit of four wheel driving. I stopped in Whitfield to get the latest weather forecast from Parks Victoria and ask a few questions. I got the information I needed and I was on my way. First stop was lunch and an armed bush walk on the way. I basically only got out of the car when a feral cat moved across the road. It was a quick stalk and an arrow found its way through its chest. It wasn't the mighty Sambar I was after but my first cat was on the ground. 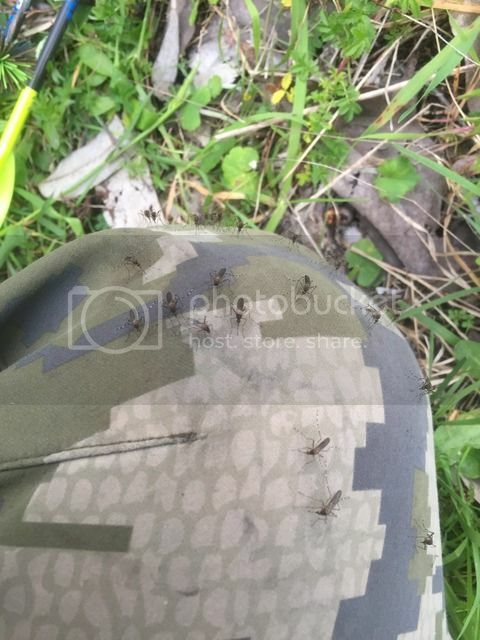 I knew I just saved the lives of a few native birds, lizards and smaller critters so I was a happy hunter. Quickly after, I jumped in the car as I wanted to get to Lake Cobbler before dark. As many tracks are closed I would drive as far as I could then proceed by foot. I had never been to Lake Cobblar so I decided I might as well see what tis all about. Park Victoria had warned me that it was going to be rather wet and cold so I might want to use the hut there for the night. I arrived just before dark and set up camp. That night was beautiful and I had a nice meal cooked over the camp fire. The next morning I woke up with a shiver. As soon as first light arrived I understood why. A good breakfast, hot coffee and some Peak Chocolate I did some scouting around the Cobbler plateau just so I could tick the "hunting in the snow" off the list. The morning was cold, foggy and misty. I spooked a couple of deer already bedded in very thick bush. I can tell you that stalking in snow is seriously hard. After the sight-seeing it was time to jump in the car to see how close to my planned gully system I could get. My first attempt that evening was disappointment. I spent two hours on hands and knees trying to get through some serious thick bush. I made it about 200-300 before I gave up. What looked like a possible solution on google earth turned out to be too steep and too dense to consider. I was now wet, tired and hungry. I called it quits for the night and got some well deserved sleep. The following day I was back in the Patrol driving around trying to find a spot where there was a possibility to reach my planned hunting area. I came across a track which may put me in the right direction but only after a few minutes I came across an area that looked a bit suspicious. 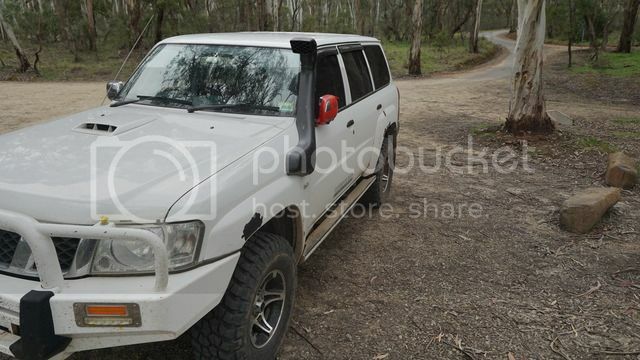 I have done a fair bit of 4wd and I had done a few training courses. All my instincts told me to check the road before proceeding. 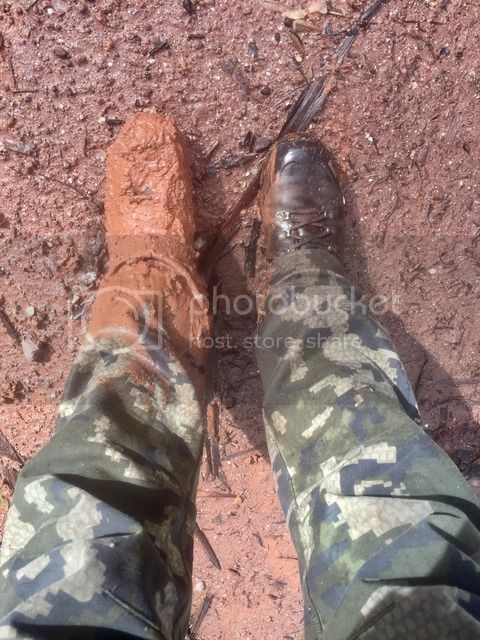 At first the track seemed good but only a meter further on my boots sank through the thin crust of hard sand. 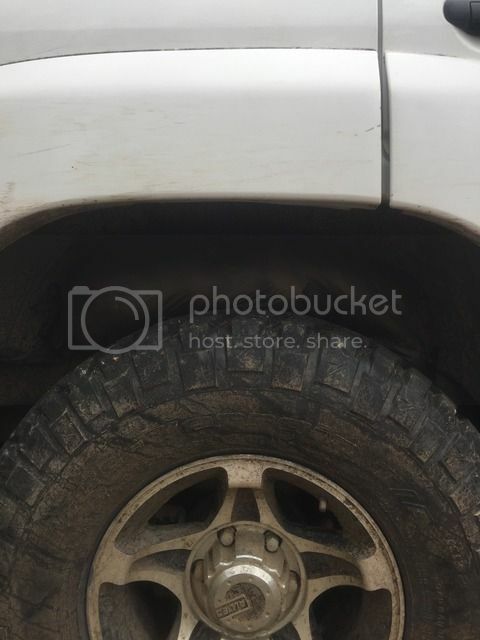 It was a mud pit. 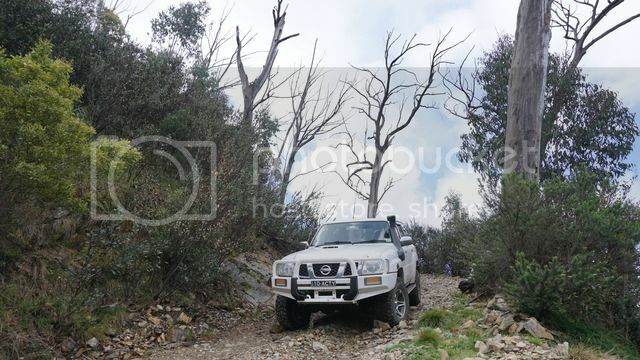 Even though I consider myself a good four wheel driver and my Nissan Patrol is a beast of a truck I have no winch and I was alone. Stupid to take the risk. Needless to say my second attempt to reach my destination failed. Back on the road. After much contemplating I finally found a optional way. I would require several hours of walking, crossing a decent creek and about 1000 m in elevation drop but I would be able to make it work. After some further driving a parked up, got my day pack and decided to do a recon mission. I came back to the car with a bit of hope. I hadn't seen any sign but I had found a possible way to my destination. 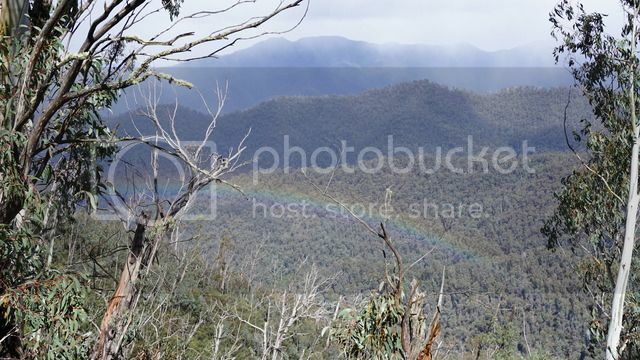 When I say the rainbow leading the way I thought it might be a sign towards the treasure in the end of the rainbow. The following morning was the first time I loaded up my Kifaru pack, double checked my back pack foods and headed off. I spent the next hours walking through rough country. It was a hard walk but doable. A few hours later I was getting close to my destination. 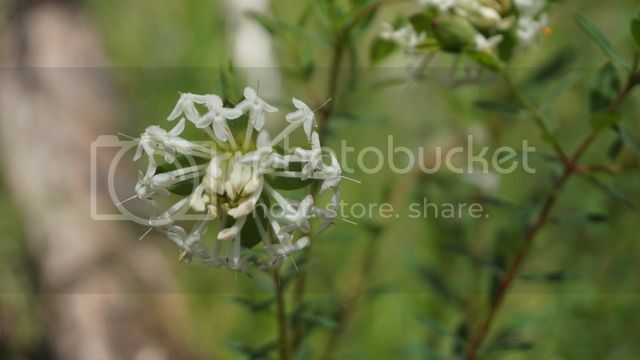 I entered a bit of an opening in the scrub. I could hear a creek to my left when suddenly I spooked a huge stag. He would have been a 28"+ boy having a snooze on the creek flat in the middle of the afternoon. Once I got over my excitement I marked the spot on my GPS for future hunts and continued my walk. A couple of hours later I finally reached the place I intended to use as base campo. I pitched my hammock and got myself a cup of well needed coffee. It was now Wednesday afternoon. I was too far away from my mentioned gully but as i spent a fair amount of time in this area I made a plan. The winds was rather firm and in perfect direction. I set off that afternoon probably a bit too early as I was so keen to finally get a proper hunt in. I travelled along a hillside, slowly making my way up towards the pinnacle. Just as I got into the "good" light I had reached as far as I wanted to go. Any higher I had to bush bash which would make too much noise to get within bow range. I was kicking myself a bit but decided to slowly traverse down the other side of the hill. After a short while I reached a quite well marked trail next to a swampy area. I walked along for a while before my eye caught some movement ahead. 60-70 m ahead three hinds had crossed the trail and was was feeding in the swamp to my left. I realised I was caught out in the open and froze... hoping for the best. Two of them fed out of sight but one of the younger calf stared my way. I could see the tail raise and I knew that she was onto me. At this stage a fourth hind came moving along. She also spotted the alerted calf and after a bit of a staring session they quickly but quietly moved along. Once again I kicked myself for being so stupid as to move along without cover. I waited for 5-10 minutes in hope that a stag would follow with no luck. It was getting darker by the minute so I made sure I moved slow and within cover. I made it another 50-100 m before my eye caught movement on my right. At first I could not see what it was but I soon realised it was a stag head poking up above a log on the ground. He had bedded similar to the one I saw earlier in the day. 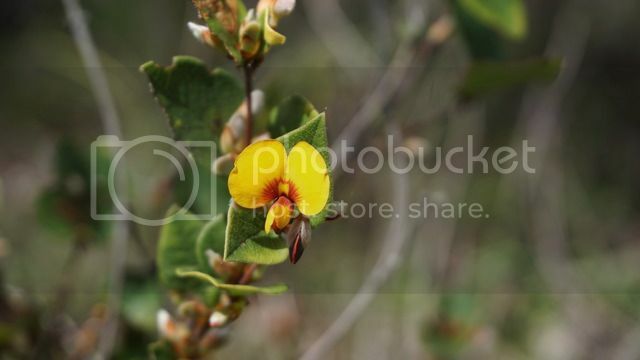 He was on the flat in pretty much in open shrub. He looked my way. I could see him licking his nose trying to get a sniff of what he just heard. 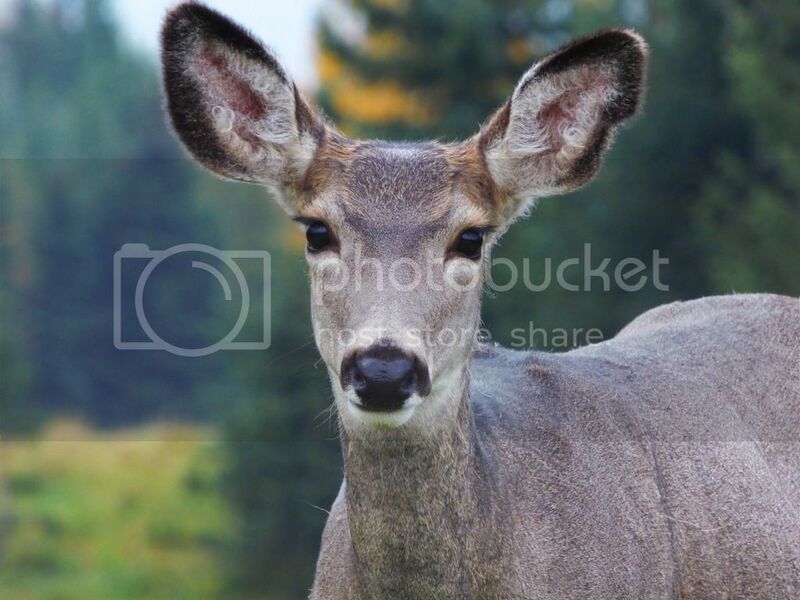 I could see those huge ears moving like satellite discs trying to pick up any slight sound. This time I was in luck. The wind was in my favour and I had good cover behind and some in front. I kept my bow arm still but as he shifted to get up I quickly knocked and arrow and as his head bobbed down I came to full draw. I had a decent stag at full draw around 20 m in front of me but he was looking my way and he had a nasty steep quartering to angle. (The worst angle if you ask me). This is where a bit of luck helps. As he took a step he spooked a rabbit. The rabbit bolted past him and turned around him. The stag did a small skip and ended up perfectly head on to me. He flicked his head around and followed the rabbit. I put my pin in the middle of his chest and released the arrow. The stag didn't realise what happened until my 540 grain arrow tipped with a VPA three blade went through his chest and dissapeared. He did a short dash and I could hear a crash, a few grunts and then quiet. The last light was almost over. Time was around 8 pm when I tried to get some decent photo before caping and taking as much meat as I could carry. I am at this stage about 3 km from camp and I know the area got a fair few wild dogs. This is my first anima since I did my caping demonstration with NEDSA (North Eastern Deer Stalking Association) and Reg Gordon. It was slow and tedious but I learnt pretty quick that slow and steady saves time later on. I did an ok job. 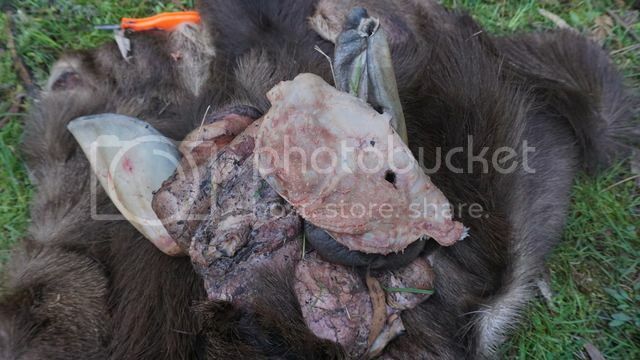 I also took and deboned both shoulders, one hind quarter, back straps and tender loins then my Kifaru meat baggie was full. The exit through the other hind quarter had pushed stomach juices through the exit hole after flipping the stag many times around so I decided to leave that behind as the meat bag was full. I loaded up meat, cape and head and started the walk back. My system for carry this much was quite poor and only after a couple hundred meters I decided to face cape and take a scull cap. Once again I found myself slowly face cape in the light of my head torch. I slipped up and got a small nick in the chin and another one inside the nose. I did not get back to camp until 1.30 AM. I proceeded to hang the cape in a tree to cool down over night as well as hanging the meat in a different tree. I had a quick bite to eat before catch up on sleep. The next morning I had a sleep in both woke up just after sun rise. I started to flesh the hide as well as I could and turn ears and lips. As this was my first go it took ages. A split ear from fighting didn't make things easier. Once I was happy, I ate a decent meal, packed up meat, hide and antler on my Kifaru frame and started the long walk back to the car. I knew it would be the hardest walk I had done so far. I left anything I did not need behind as the bag already weighed around 40-50 kg. I am fit guy but the next 4.5 hours where hard. At some stages I had to take aim at a tree up the hill. Walk 10-20 m then sit down to catch my breath. I had constant lactic acid but was determined to get everything back to the car. After all this is half the fun for me. I love pushing the boundaries of what my body can do. Half way through my delirious walk I stomped through the densest part of the route. I suddenly saw something yellow flick up just in front of me. I froze and quickly took a step backwards once I found a pissed off tiger snake only a couple of steps infant of me. With the extra weight on my back I almost lost it. I got behind a log and kept an eye on him. He was perfectly camouflaged with the brown stripes other than the yellow under his head. He had flattened his head in a coiled position and wasn't planning to move out of the way anytime soon. Unfortunately in an attempt to lower my weight I had left my camera behind and only had my iPhone so the image was crap. 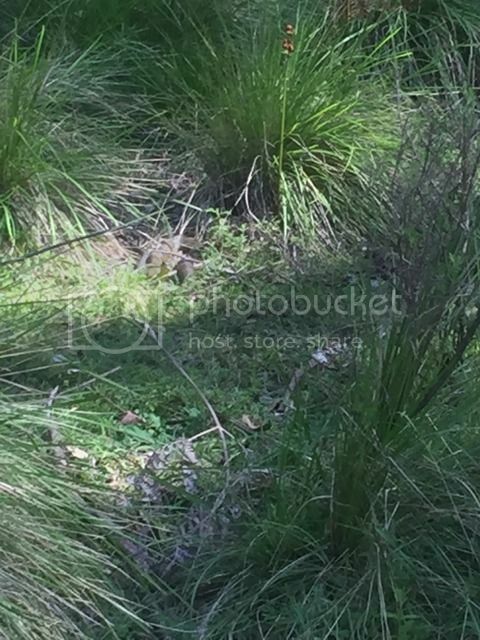 You can see him in the middle of the photo between the tussock. Needless to say, he got the respect he deserved and I took a different path, this time a bit more alert. 4.5 hour later I finally reached my car and the 3 kg salt. I salted the cape as well as I could and tried to find a spot to leave the meat. I had broken the handle which I normally use to hang the meat so I opted for hiding it in the front wheel guard of the car to keep it out of the sun. The temperatures would be cold enough to keep the meat safe. I quickly grabbed some food from my stash in the car and started the trip back to camp. I had 3 hours to get there before dark which was doable with an empty pack walking downhill. I walked down to the last gully in about 2 hours before deciding to slow down and do a bit of stalking. Nothing showed until I was almost back at camp. I heard a stag rub a tree in the thicker stuff. I got a 5-10 minute stalk until he spooked at around 30 m, probably from my scent. Still it had been an amazing day and the last stalk made it even a bit sweeter. Dinner that night was Ramen with beef jerky. One of the best meals in the bush. I had some lollies for desert and a hot cup of tea before quickly falling asleep. I woke up content but also with the urge to do a proper spot and stalk as I spent most of Thursday processing and looking after the version. After a quick breakfast I packed my bag with a few extra snacks so I could stay out longer without getting too hungry. Another brilliant piece of equipment in my pack is my Sawers mini. A small water filter which meant I could drink from any of the small mountain streams and still not have the risk of getting sick. It was a foggy morning and the cold kept creeping inside my jacket. A few minutes later traversing the hills made me more comfortable. I stalked up the feeder gully that I had hunted the previous night with no luck. It's amazing how Sambar change their habits and movements with seasonal change. This particular gully used to be my sure bet for an encounter but this time i lucked out. I decided to move further and one by one I slowly crept though the feeder gullies. A couple of hours had past since I left camp the sun was shining in the early morning. I came to halt just as I finished a slow and tedious stalk through dog wood and rubble. I started to get short tempered, I know this is happening when I snap a few more twigs than normal. I have learnt over the years that this is the time to take a break as you won't get within shooting distance of a Sambar if you stomping through the bush. 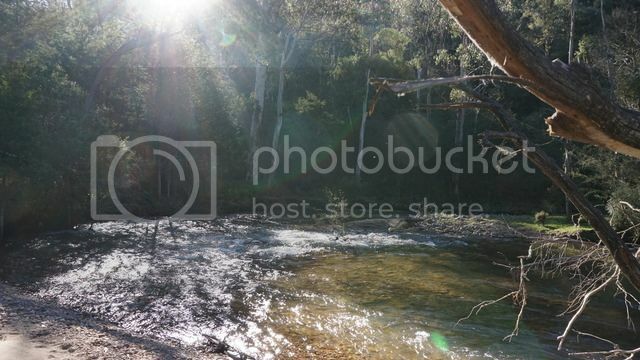 I sat down and enjoyed a muesli bar and some cold water out of a nearby spring. I sat down for a few minutes to admire the beauty of the untouched bush. 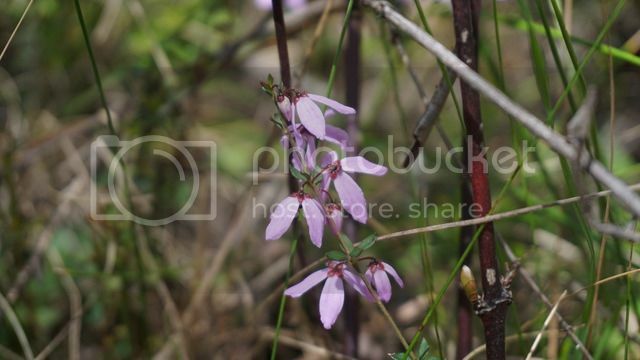 Spring had arrived and it was flowers covering most every clear space. Soon I felt better and I started a slow and deliberate stalk up towards a spur which looked like to could hold some Sambar. I had only stalked for 15-20 minutes when I got HONKED. I saw a brown and tan rear end bolting over the crest. Even though I enjoy the honking it is a reminder that they won and I lost. I remembered reading somewhere that Sambar nearby most often do not alert from the alarm barks. I sat still for 5-10 minutes and then slowly continued up the spur line. I walked a bit higher on the hill than I planned as the previous bedded deer had been a fair bit higher up the hill and due to the now raging thermal winds I though it was better to stay high. I had not covered more than 50-75 m when I saw bushes thrash only 20-25 m below me. I had basically snuck up on a stag and he had heard my approach. He bounced up and ran a short distance. As he stopped I nocked and arrow just in case. He then stepped out in front of me alerted and looking all around to find the source to what or whom had ruined his morning. I ranged him at 45 m and clipped my release aid in place. He slowly took a few steps and stopped broadside. I automatically came to full draw but hesitated. The shot was now far, around 50 m on an alerted deer. Add to the situation I was kilometres from camp. 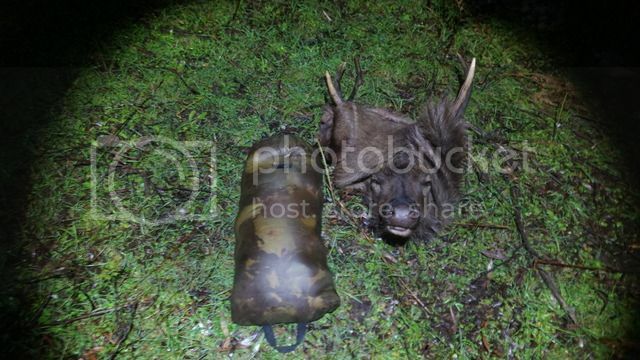 The stag was quite a bit smaller than the stag I shot the night before. I let down and watched him walk across the gully and disappear over the ridge. What a buzz. 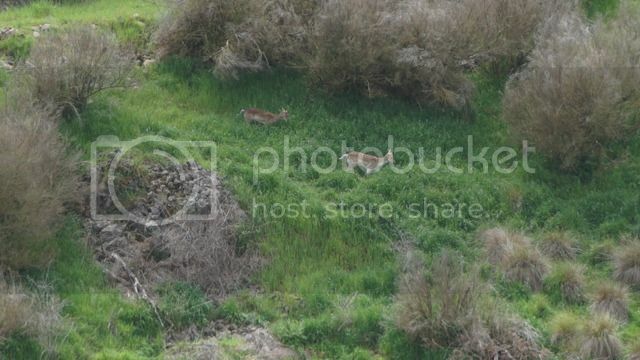 I soon realised that all the deer would have moved to higher ground and the possibility to stalk, spot and shoot a deer in thick cover is more or less impossible so I walked back for lunch. During lunch I figured that I probably should not leave my venison without ice for too long so I planned to break camp and try to reach the gully I originally intended to hunt. Said and done I was on my way. The walk wasn't as bad as I envisioned and I reached a beautiful camp spot not far from where I wanted to hunt. The creek was higher here and I decided to set my hammock as close to the stream as I could. Nothing beats falling asleep with the sound of running water. 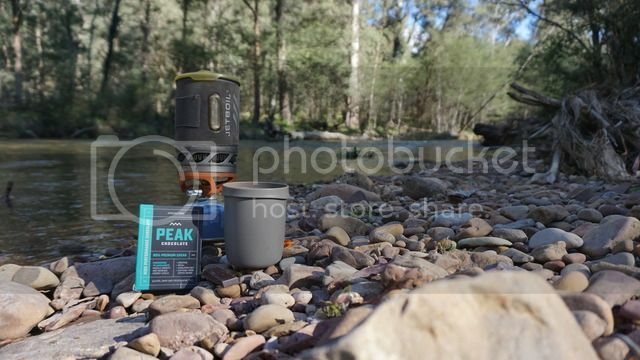 I love a good cup of coffee so having instant coffee for a week isn't the best experience but when you can sit on the creek edge with a coffee and piece of Peak chocolate... instant coffee is alright. It got later in the afternoon and i was now on my way to the same gully I had missed my big stag the year before. I got to within 200 m when I realised it was too early in the afternoon and the thermal winds where still flowing up hill. Knowing that the deer could smell me several hundred meters away, especially after a few days in the bush I quickly turned around and went back to camp. I recharged and decided to hunt the shadow side of a gully until the sun went down then quickly make my way up to the main gully. I came across a swampier piece of land and slushed around in the water for a while. As it was so wet every step was slow, not to make to much noise. After my third of fourth coffee that day I found natured called so I looked for a better spot further away from any water source. I made my way up the hill and in this weak moment I may have walked a bit faster and clumsier. 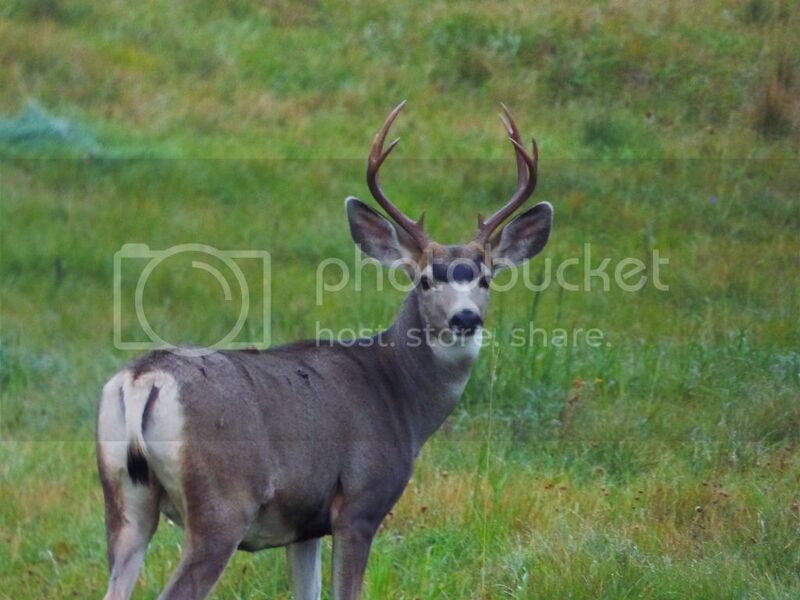 I put my bow and bag down, turned around and stared straight at a lop-sided stag. He looked as surprised as I did. He was young with a shaggy mane and made a clumsy escape away from a bowhunter without a bow in hand. I had to laugh at the whole situation. On the way back the camp I came across the wallow he was most likely stalking. I would suggest that a smaller stag like himself would probably need to be careful not to encroach on the big boys territory. I got half way up the gully where I missed a big stag previous year. I got a glimpse of a brown shiny coat between the trees. A medium sized stag came calmly walking down the gully just like the larger stag had done last year. The gully is steep and at night absolute whisper quiet. I decided not to even try stalking as the ground was covered in dry leaves and debris. Slowly sat down on my knees, knocked and arrow and waited for him to come closer. 5 minutes later he was in the bottom of the feeder gully, level with me at 35 m. I was surprisingly calm when I came to full draw. I split the 30 and 40 pin across his heart and squeezed off a shot. Until this moment I had been overly confident. This animal was mine and even though not the largest stag he would be tasty and was close enough to camp for a full recover. Unfortunately for me the deer must be related to Chuck Norris. He did the most agile duck I have seen and my arrow cleared his back with easily 10 cm. As the arrow stuck in the ground only meters from him he slung his head around. He didn't run but rather started to scan the surroundings as if he was looking for the noise. He started to stomp his hoof and the tail flicked up and down. I nocked another arrow and waited for a clear shot which never arrived. He slowly stomped his way up the hill. I watched him for the next 10 minutes as he honked, stomped and made his way further and further away. I could not believe it! I had missed another stag in the same gully. I was so certain of this shot the only thing I can come up with is that the steep gully in the afternoon makes any sound travel. I should say that my bow is very quiet. The only source of noise I can think of is my drop away which has a slight slapping noise. I have never had an issue with this before but then again I don't shoot that many Sambar. Needless to say I am now researching the most quietest rest. My arrow is also an arrow put together with noise in mind sporting Flex fletch SK300 vanes and VPA broad heads. Being the last night of hunting this spot I once again lowered my head and walked back to camp. I ate and feel asleep listening the the fast flowing water. I had a slightly broken sleep as I was a bit cold. 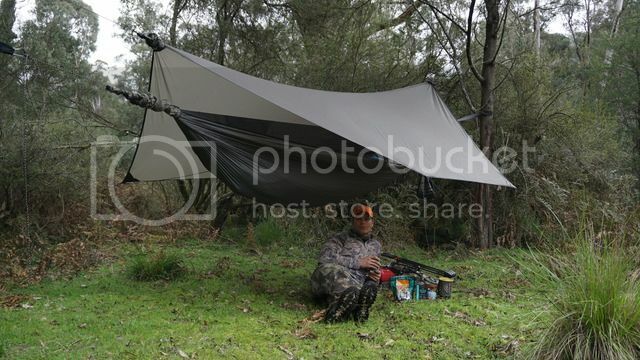 The last few days brilliant wether started to turn and the cool wind made the hammock colder than normal. In the early hours I woke up to stretch out. I freaked out when I heard a loud thumping sound just next to my camp. By the sound of things a decent Sambar had made it down to the creek and almost walked in to my rain fly. The deer probably freaked out even more than me as I heard it flee through the creek and up the other side. I was now wide awake. Adrenalin. The next morning was cold and misty. I stalked up towards the wallow I had found the previous day. Nothing was there so I walked up the hill a bit. Suddenly I heard a very faint stick snap. Knowing that it could be one of many animals in the ANP but also a Sambar I stood still and waited. It wasn't long until I got another stick snap, this time a bit louder and closer. It was a larger critter that was for sure. I made my way towards the sound until I had a large gum as backdrop, nocked and arrow and waited. I could now see the dogwood wriggle and I was sure I had a sambar come closer. I had a clear shot about 20 m in front of me. The supposed deer got closer and closer but only meters away from the clearing it turned on a dime and bolted up the hill. I was busted... Strangely I felt ok with it. I called it for the morning and started to pack up. 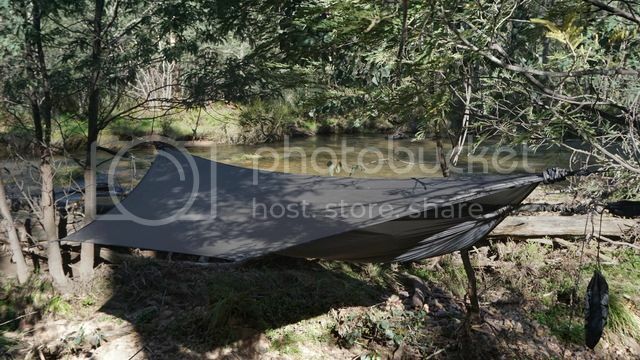 Only when I undid my hammock from the trees I realised I by mistake had hung my hammock in a rub tree which could explain the nightly encounter. Sun was pretty high when once again shouldered my Kifaru pack and started to walk back towards my truck. As I walked along I made mental and gps notes for next time. I passed the wallow and did a dog leg to check it out. I reached a part where the trail was a lot wider, almost the size of a road and short grasses made it easy to see. At this stage I am stomping my way along so to my surprise I spot a deer in some thicket only 50-60 m away. Mr Lop-sided was there again. He had spotted me but tried to sneak away. I watched this big brown cow like creature do something that looked like a mix between a crawl and a erratic walk. He would take 2-3 steps then freeze then another 2-3 steps. His head was lowered towards the ground and his neck almost inline from nose to tail. He did this across the open laneway and I almost laughed at his pathetic attempt to hide. He soon disappeared into the thick stuff but he will need to hone his sneaking skills if he want to survive much longer. The walk back to the car was easier than before as I had a fairly light pack and tummy full of food. 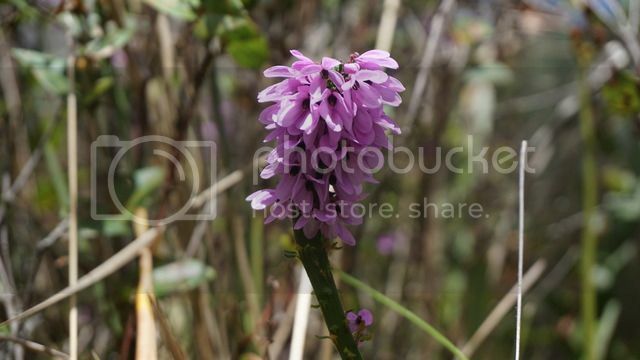 I stopped and took photos on some more flowers and the scenery which I would most likely not see again for 6-12 month. I reached the car in good time, only to find that some critters had tried to steal my version. Of the 30-40 kg I carried up I lost 5-10. The had also ripped a few holes in the sil-nylon so parts was fly blown. I cut of any contaminated meat and repacked it. I got left with probably 20-25 kg. I assume it was wild dogs or cats but either way if I caught them in the act... they would have been less of them. The cape got left alone as it was covered in salt. 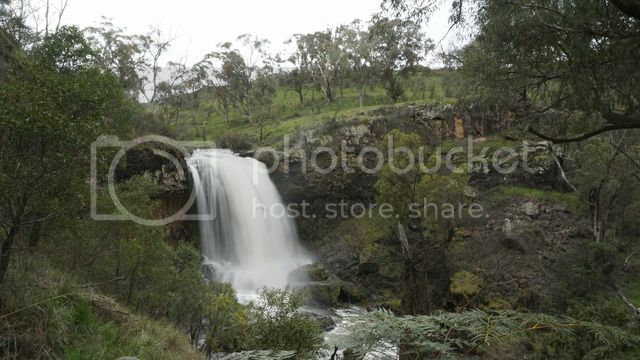 It was still pretty early so I decided to take the car for a spin and look at the Dandongadale falls on the way home. The where far away and it was misty. A photo does not capture how powerful the feeling is standing and looking out over the gully with water pouring all over the face. Apparently a 255 meter fall. Soon I was back in 2 wheel drive and the sun was getting lower. I think most of you can relate to the fact that sitting in a car during prime hunting hours is frustrating so I quickly grabbed some take away in Wangaratta and scoffed it on the road. I had found a piece of state forest which was hunt-able. I did not know anything about the place but that was ok. I reached the edge of the forest just in time. I was a bit stressed so when I navigated through the trees for a place to park I accidentally reversed too close to a tree leaning out so a snapped my passenger side mirror off. Stuff it, I hunt first fix later was the though as I got ready. In hind sight I should have stayed on the road. I found a few trails and two rub trees which I sat off until dark. The only critters I saw was these flying devils. I learnt that if you smell like a Sambar stag mosquitoes love your pants. I continued driving towards the border to make my drive back to Sydney on Sunday a bit easier. I have a spot I normally hunt on the way home and this trip wasn't different. 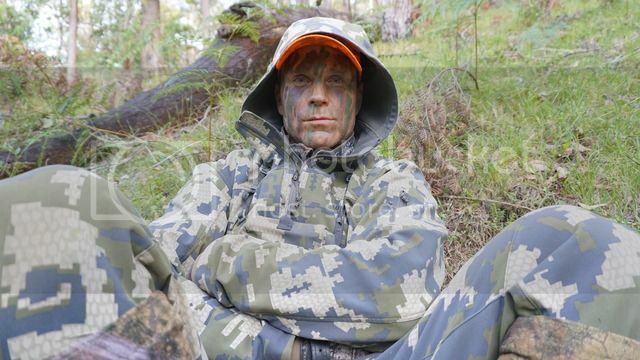 I arrived late at night, jumped to bed ready for my last morning hunt for this trip. The plan was a small walk traversing a hillside. It was surprisingly easy to get out of bed considering a thumper of a week. As planned I traversed across the hillside. I saw very little other than beautiful scenery and the odd native critter. However I am a creature of curiosity so I continued gully after gully after gully. The terrain got steeper and harder to traverse. I glassed and walked more and more.I was surprised I did not see any deer. I got to particular steep part which had a flatter spur line running along the side. I was about call it a day when my eye caught something odd. I grabbed my binoculars... Sambar. I was 72 m away from a bedded hind. She was laying up against a tree. From experience I assumed that there would be more, even if I could not see them. I took my boots off and on with my neoprene sox. I slowly made my way towards the hind, glassing in between each few steps. Suddenly I see a larger stag step out and walk out of view. 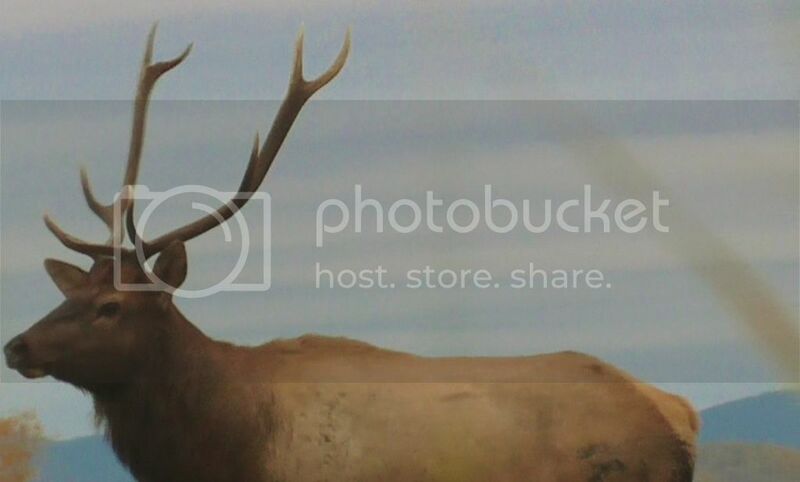 I decided to try to sneak up as close to the stag as I could. I took a few more steps and glassed. This time I found a few tines. Another smaller stag had been laying only meters away from the hind and I had not noticed. Over the next 10-15 minutes I closed the distance to 50 m when suddenly the hind stood up rapidly. The thermal was shifting and I assume they got a whiff. I don't blame them. They stayed around nervously for another couple minutes before moving on. I walked another few gullies over and bumped one more family unit of Sambar deer before calling it quits. I got to my car just before lunch and was on my way towards Sydney. 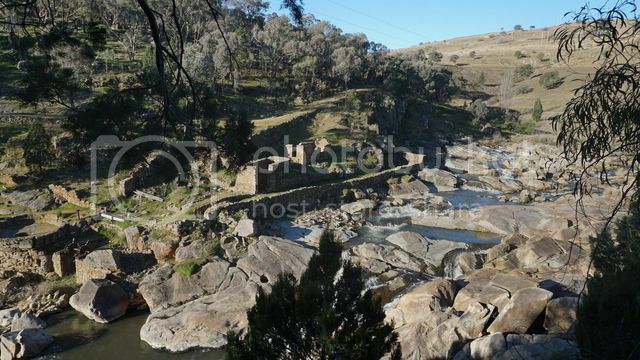 The second stop I did was the Adelong gold mine site and falls. I forgot to take photos but I have some from another time I passed through. Worth the little walk along the river. The last stop I did was as the sun was getting a bit lower. I spotted some fallow feeding across a gully. My camera only have a 50 mm lens but a optional x4 digital zoom hence the fuzzy image. Still loved finish the trip watching some deer. There's so much more to the hunt, than the kill! For almost as long as I can remember I’ve wanted to hunt Elk and I’ve wanted to hunt in Canada, I’m not sure why it’s just one of those things you get stuck in your head and have a hard time thinking about much else. 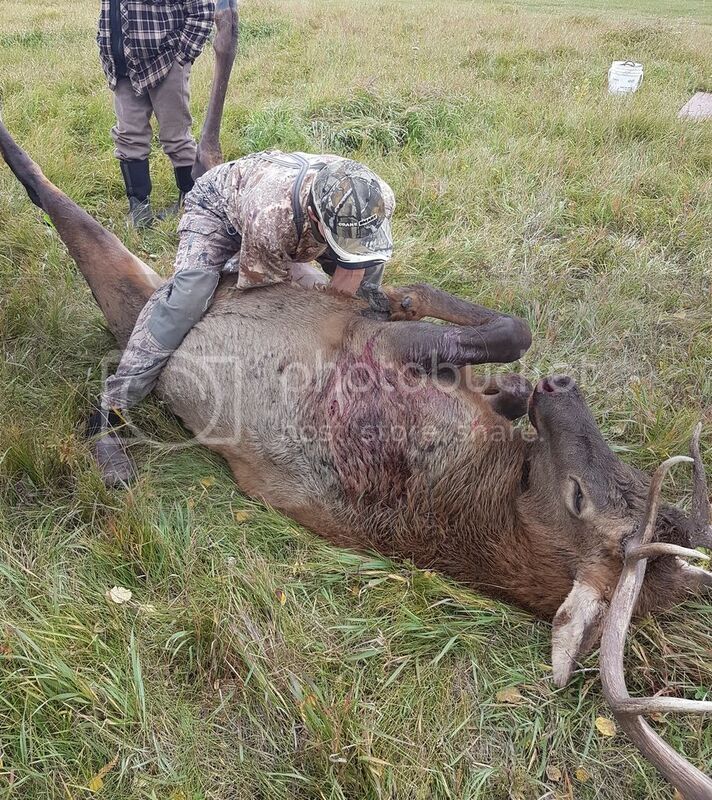 Early 2014 I decided to bite the bullet so to speak and commit to a Guided hunt in Alberta.For those that are unaware unless you are a Canadian resident you must hunt with a guide so trying to do this hunt on a budget was going to be a challenge. After getting the all clear from the minister for war and finances I started to research outfitters and saving my pennies. Recommendations from my booking agent and a few discussions with previous clients had me settling on Rick Guinn Outfitters. 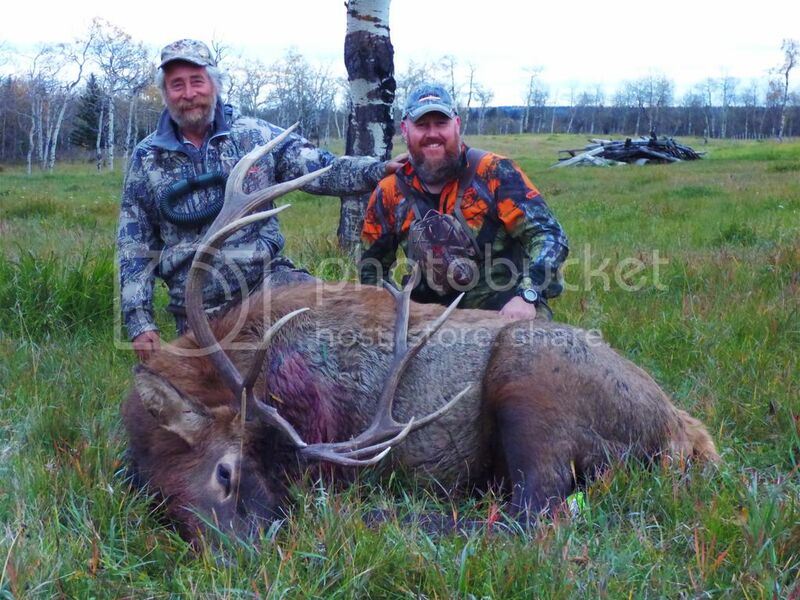 This was not the cheapest option however with Elk hunts in Nth America having a very low success rate and knowing several guys that have come home empty handed Rick’s outfit seemed like the highest percentage chance for me to get a free range Canadian Rocky Mountain Bull Elk. One thing I cannot stress enough is to do some homework before shelling out your hard earned dollars on a guided hunt and the cheapest option is not always the best especially if you’re unsuccessful and have to go back and do it all again. There were many factors that almost derailed this trip before it even began. The Aussie dollar nosedived by 30%, unexpected financial expenses at home and to top it all off about 12 months out a work related accident saw a large chunk of cartilage torn from the bone in my right shoulder. At this stage it would have been pretty easy to throw my hands in the air (well one of them at least) and give up however that wasn’t going to be an option. A discussion with my surgeon helped put things into perspective. On viewing my MRI scan he advised that the damage was done and shooting my bow was unlikely to create further damage so if I could put up with the pain I could recommence shooting and we would schedule the surgery for after my trip. I couldn’t wait to get home and backed my Hoyt Nitrum Turbo off to 61lb’s, commence a diet of pain killers and anti-inflammatory’s, grit my teeth and get back to shooting as regularly as I could. The last few months flew by and before I knew it was time to fly out. Nagging doubts as to whether I was ready or not had to be ignored as the time for preparation had well past. 32 hours and 4 airports later had me disembarking at Calgary International absolutely buggered but eagerly anticipating the next 9 days. Rick was there to greet me and to describe this guy as a character does not do him justice. A living legend is more fitting. With 40+ years in the guiding business under his belt he has seen it all and can recount most of it. Apart from that he’s been a Cowboy/Rodeo rider, starred in a 1970’s western movie Buffalo Rider and been an animal handler for grizzlies, buffalo, mountain lions, wolf etc. Rick’s father guided Fred Bear on numerous occasions and Rick spent holidays at Fred’s home. The daily yarns and storytelling during the midday down time were entertaining and educational to say the very least. First job when arriving at camp was to check my bow and after many hours of broad head tuning I went from accuracy at 70 yards to almost missing the target at 20! WTF? This did my confidence no good whatsoever. I found my arrow rest had moved during transit and although I had noted where it had been before I left I was unable to replicate the accuracy that I had previously enjoyed. I persevered with tuning over the next couple of days but without being able to paper tune I struggled to be confident at distances greater than 30 yards and unfortunately no close shot opportunities were presenting. Finally I opted to change out my Slick Tricks for some mechanicals that I had brought along just in case and almost immediately had pin point accuracy back out to 60+. The parcel of land that we were hunting was made up of 50,000 acres of rolling foothills at the base of the Rocky Mountains. 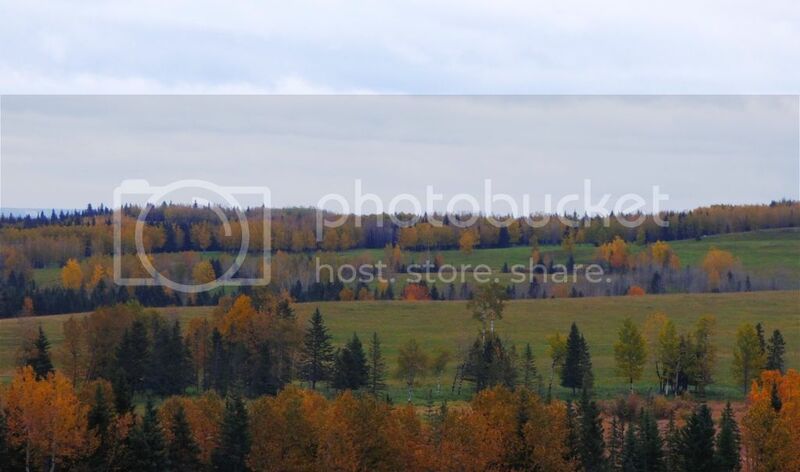 Fall colours where starting to kick in with golden yellows and burnt oranges of the Birch, Oak and Willows contrasting against the rich greens of Spruce and Pine. The landscape & wildlife was all that I had hoped for and dreamt about for so many years. 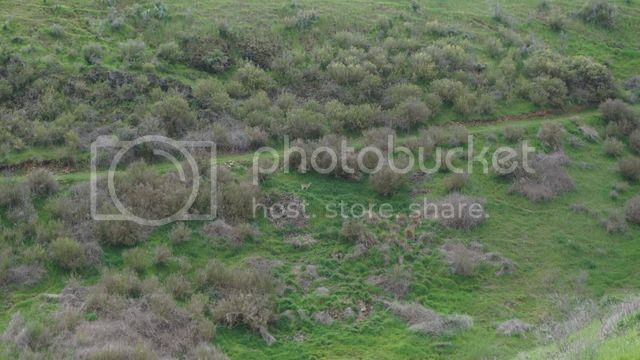 To begin with the Elk where spread out all over place and spotting and stalking was made possible with good tree cover and undulating terrain. 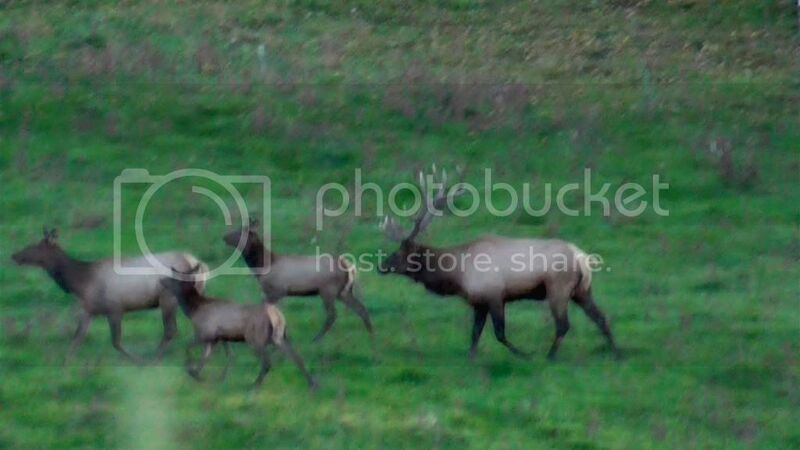 The policy of the guides I hunted with was to never push the elk and for very good reason. We would sneak into position for an ambush however if that failed we simply waited for the next opportunity as pushing the elk would result in them leaving our designated hunting area as these animals can cover some serious distance in very little time! 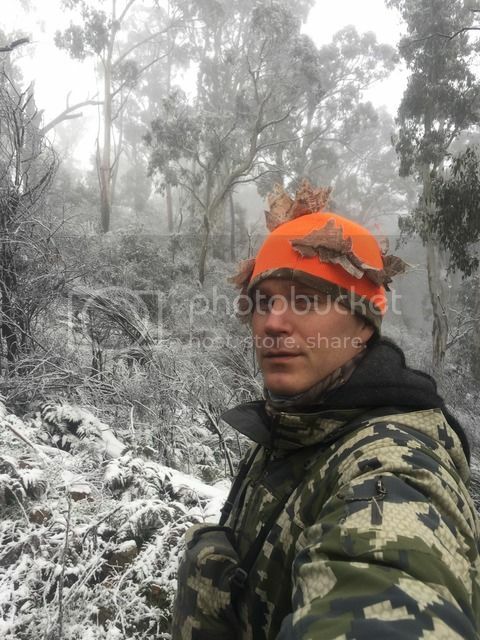 Those first few days where truly an eye opener for me, I’ve hunted the rut here in Australia for almost 20 years and had many memorable encounters with Fallow and Reds doing their thing but to be in the middle of Bull Elk screaming their lungs out and chasing cows all around you is an experience I will take to the grave! Absolutely mind blowing the noise these things can make. The first 5 or 6 days where pretty much the same every day. Set up before first light where you think the elk will exit the meadows and try to cut them off on the way to their beds. Next scout for lone bulls that could be either called or stalked and then for the afternoon set up for where the elk might come back out onto the meadows of an evening, all the time trying to figure out where the wind would be coming from and which routes the elk would take. Every day we were close to taking a good Bull but just couldn’t make it happen for one reason or another and just needed a little bit of luck. Over those first 6 days the elk herd grew on the main meadow from 30 to 70 to 120 to 200 until finally there where well in excess of 300 in the herd as the rut began to peak. This is truly a sight to behold and the racket coming out of that meadow before first light was incredible. The morning of day 6 we watched the herd move off the pasture to bed in a huge patch of timber next door which belonged to a Native American tribe. The wind that evening was perfect so we set up in a thin patch of timber on the edge of a finger ridge with a large beaver pond on the opposite side funnelling them past our ambush spot, I could not have been happier with the set up. 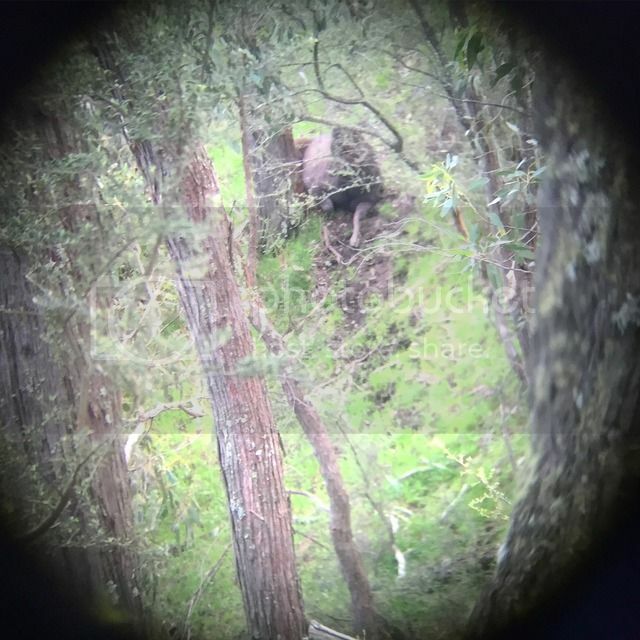 The elk started to come rolling in down from the timber echoing bugles and cow calls through the timber, fighting, fornicating and tracking exactly where we had expected them to. The first 80 to 100 passed me at around 90 yards and I was content to just sit watch and video the parade and not push them for a shot as there was another game trail at 40 which many of the others were sure to use and It looked as though my luck had finally changed. Almost on queue half a dozen Bulls began on the trail I was set up on and all I had to do was to sit and wait for them to pass and pick out the Bull of my dreams. Usually when things are going this good the proverbial often hits the fan and this was to be no different. It seemed the Natives where getting restless! Right then a volley of 5 shots followed by another 3 from heavy calibre rifles sent the entire herd fleeing to the safety of the dark timber. Never in the past 20 years had this happened and it was just my luck that minutes before fulfilling a lifelong dream they decided it would be a good time to fill their freezers. The Traditional land owners have every legal right to hunt whenever they like with weapon of choice regardless of the season on their land. In this case however the law was broken, boundaries had been crossed and charges of trespass where later laid by Fish and Game who came to investigate the incident. This did nothing to help us at the time as the main herd would not return for the remainder of my hunt. In the previous days I’d had many encounters with small bulls all of which were passed up as after seeing the quality of the main herd bulls it was hard to contemplate pulling the trigger on anything less than a 360 class Bull. 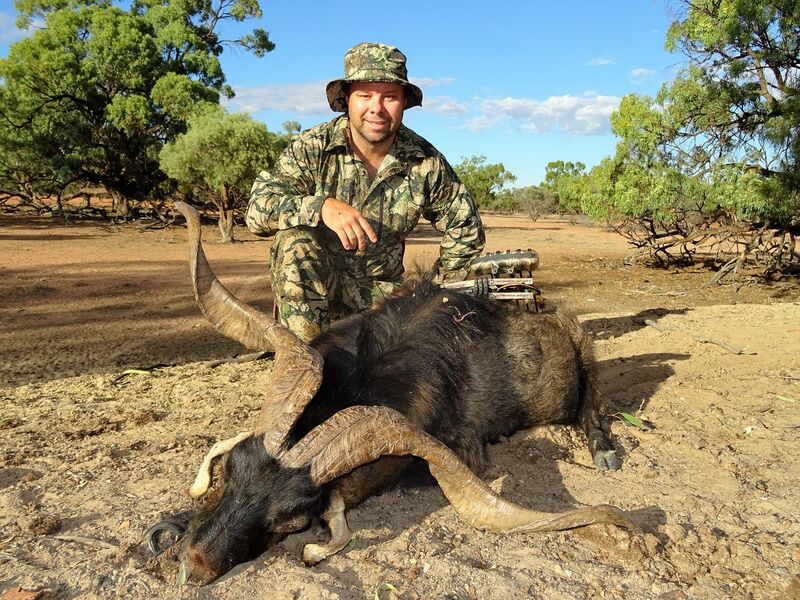 At this stage if I missed out on a Bull it wouldn’t have been the end of the world as the experiences of the previous 6 days had fulfilled or surpassed all my hopes and expectations. The next couple of days were pretty quiet and it was hard work even trying to locate an elk. On the morning of day 8 Rick took me to another part of the property where there were a few smaller Bulls that had been seen the night before. A plan was made to be in position before daylight to catch them as they went back into the timber. We got there a fraction later than we would have liked and were met head on with a dozen cows making their way back to the timber. With very little cover we both dropped into the knee high grass along a fence line, lying flat we hoped they would pass without spooking the bulls that were following. The cows stopped looking intently in our direction however soon settled down and proceeded to the safety of the timber. Rick then grabbed a couple of dead branches and hurriedly set up some cover to give me a chance at getting drawn just in time for the Bull’s to arrive. I watched the antler tips of a couple of Bulls over the crest of the small hill in front of us as they jostled for position and continually checked the remainder of cows that were still coming. Finally the biggest Bull decided it was time to make a move and came into full view on the crest of the small hill and made his way to the edge of the timber line. 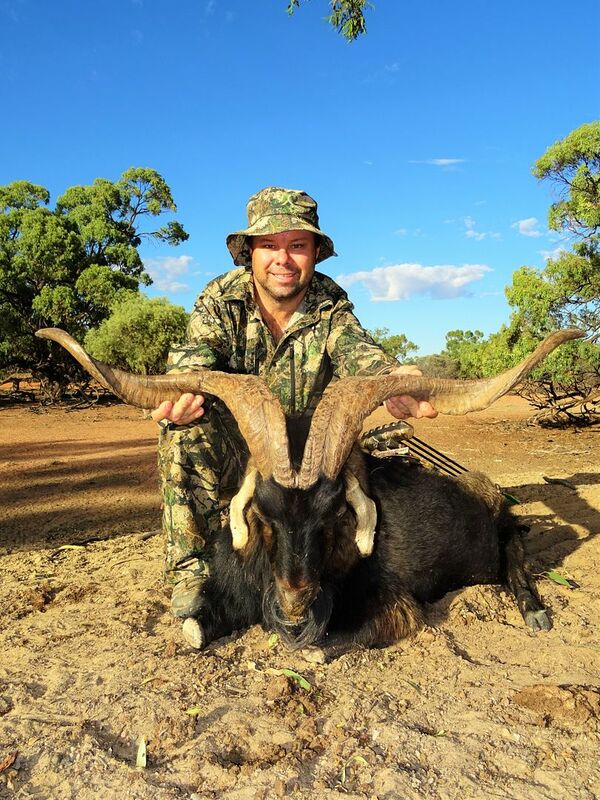 Rick ranged him at 41 yards and I counted 6 points on each side so it was then that I decided it would be better to go home with a small Bull than none at all which was looking increasingly likely. 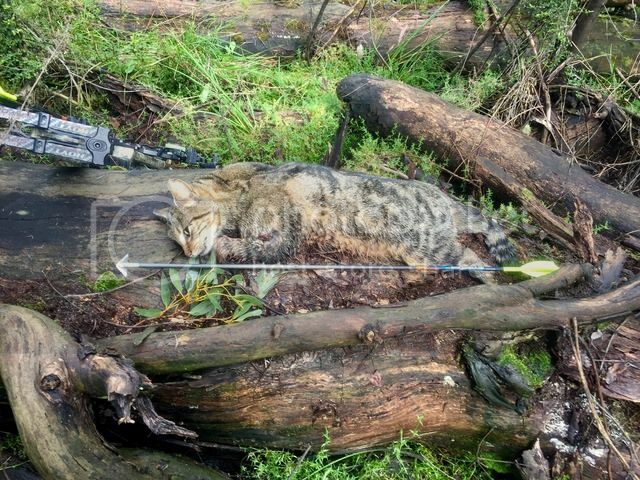 Rick pulled him up broadside with a gentle mew on the cow call and my arrow flew true passing through his chest cavity tight behind the shoulder taking out both lungs exiting the off side. The Bull was down in seconds and only made it maybe 50 odd yards from where he was first hit. There it was, a moment of both joy and disappointment all rolled into one! Joy for being successful and making a good clean kill shot and immense disappointment for knowing what really could have/should have been! 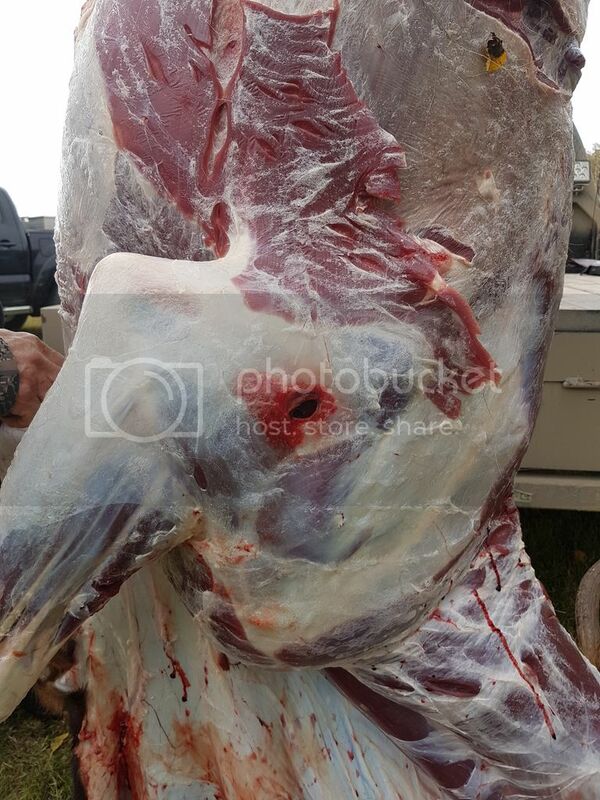 We recovered my Bull and I was pleasantly surprised to see just how well that Swhacker broadhead did on such a large bodied animal. Mechanicals are largely frowned upon for use on big game and with good reason but better to have hit him exactly where I wanted than to wound him due to poor arrow flight and lack of confidence in my set up. I’ve taken many deer with these heads and have always been impressed by their design and performance. Unlike most mechanicals that open on contact loosing a great deal of kinetic energy on entry. These heads open once they enter the rib cage exposing fresh sharp blades resulting in devastating penetration. The size of these things on the ground is surprising and luckily for me we were able to drive a vehicle right to him as a carry out with my dodgy shoulder was not going to be an option. We caped and butchered him up back at camp consuming back straps and tenderloins that night which where amazing! The rest was processed and used by the guides and outfitter with some being donated to a needy family which gave me great satisfaction to know that none of the meat would be wasted. I had wanted to take a Black Bear while there however high Grizzly numbers meant all the Black Bears had left the area. Always a good thought to have in the back of your mind while sneaking around the woods in the dark especially after finding fresh Grizzly tracks over the top of your own footprints. 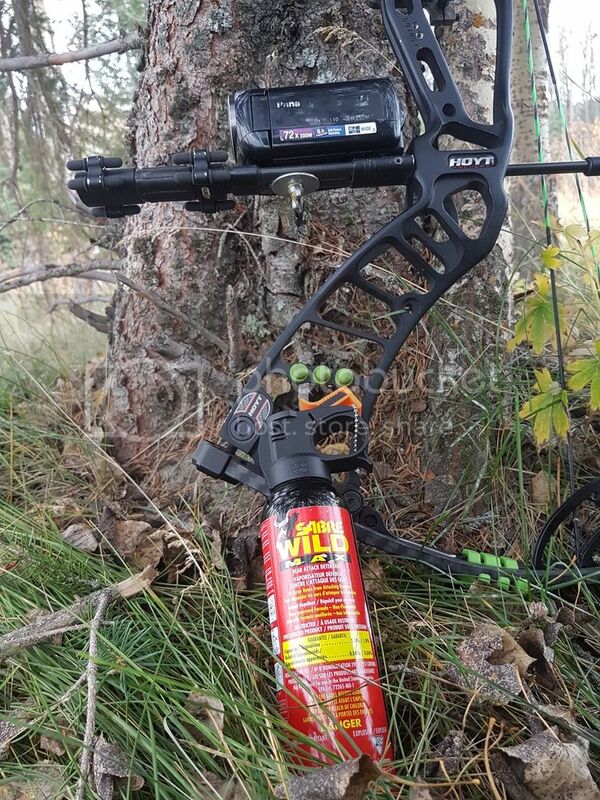 All of the guides had been involved in Grizzly encounters in recent times so either bear spray or 12 gauge pump action bear repellent was carried. On the way home I stopped off in Minnesota for a week to visit with my sister who has lived there for the past 30 years. I had prearranged an over the counter deer tag and proceeded to take a small 8 point whitetail buck on a DIY hunt. I’d set up on the ground between a drainage on one side, picked soy bean field in the middle and standing corn on the other side running down to a pinch point surrounded by cottonwood trees. 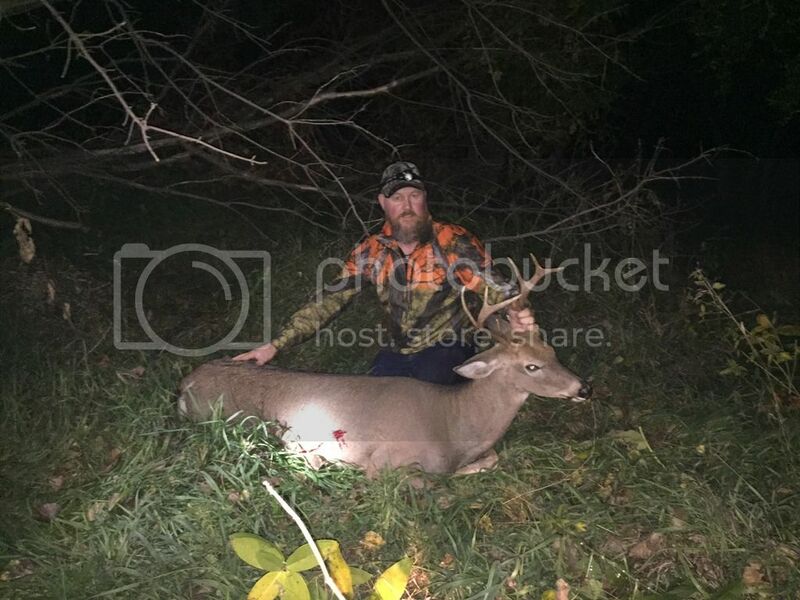 The little buck followed the script to perfection and once again the Swhacker broadhead did it’s job ending his life quickly and humanely. Again we consumed the good bits on him while I was there and the rest was processed into burgers, deer sticks and my all-time favourite Jalapeño cheese kransky’s. I managed to pick up some bug on the way home which made the unenjoyable trip home almost unbearable but was glad to finally be home with the family again. I have since had my shoulder reconstruction done and am looking forward to full recovery before next year’s rut. 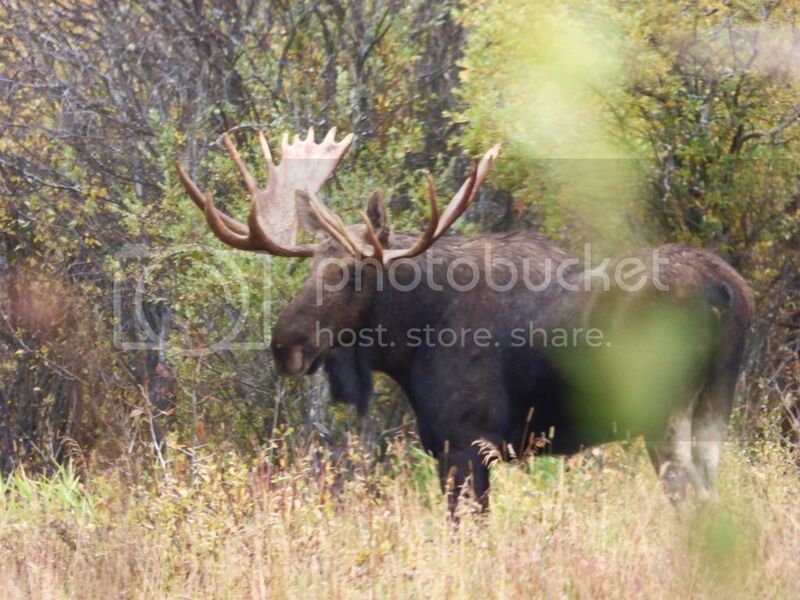 In the meantime whilst recovering I am having a hard time getting the Images of Bull Moose out of my mind. 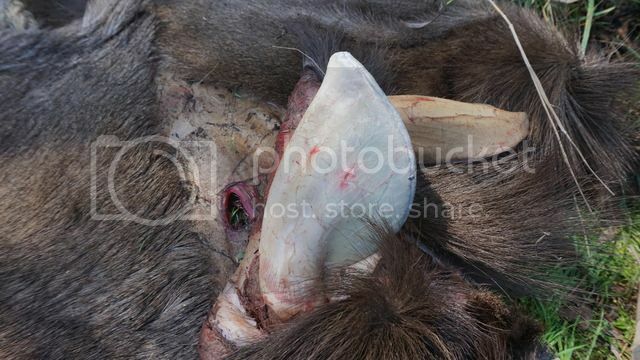 If you’ve ever stood over a fresh Moose scrape you will know that it’s an aromatic experience that will sting the eyes and cling to your sinus cavity like nothing I’ve ever encountered before. Something to think about for a future trip perhaps! Gear Used: Hoyt Nitrum Turbo set at 61lbs, Widow Maker Smash 350’s arrows & Swhacker 125grn 2 ¼” mechanical broadheads. Total arrow weight 500gns. Ps. Apologies for some of the photo quality as some pics were taken from video footage or mobile phone! With nothing on today I decided to go for a quick drive and see if I could find a billy or a pig. Ended up getting these two just a few minuets apart from each other and all wishing 10 minuets from the car. There nothing special but still a bit of fun.